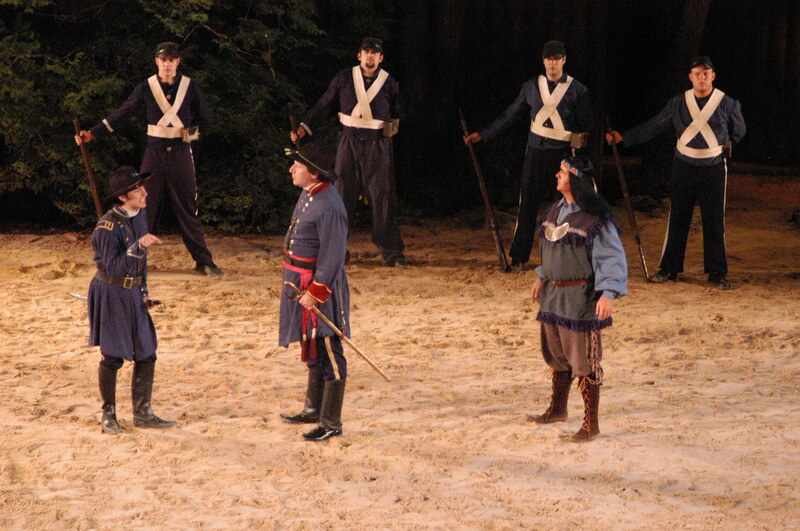 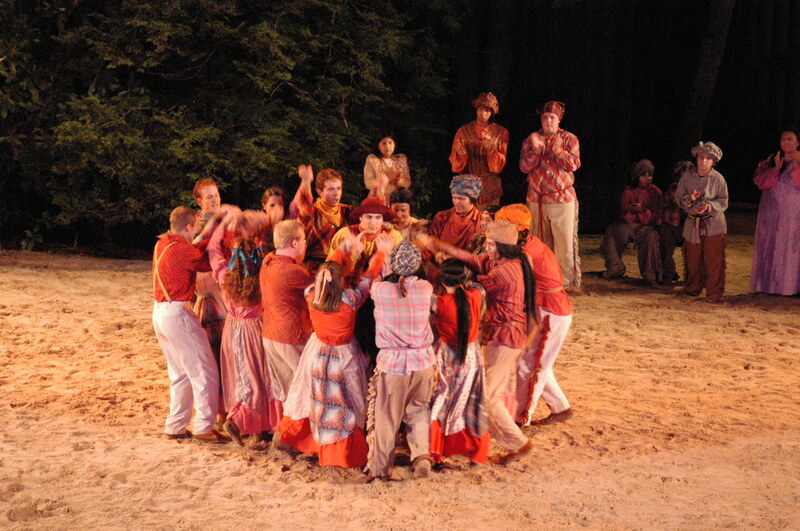 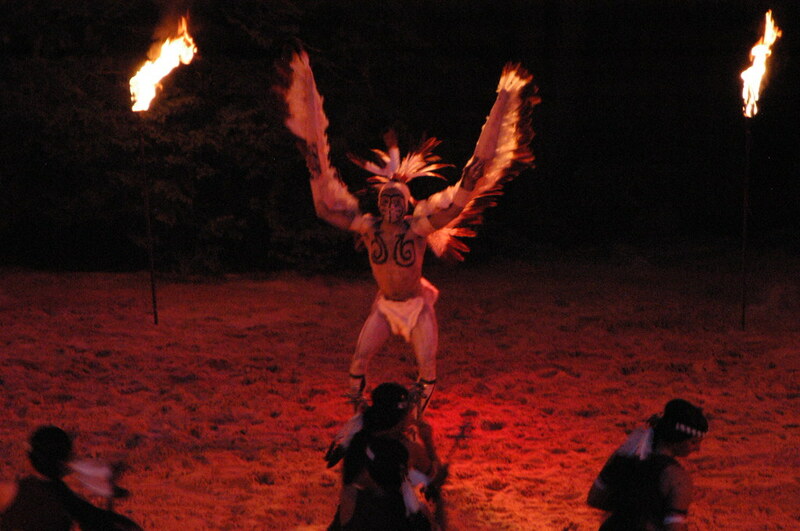 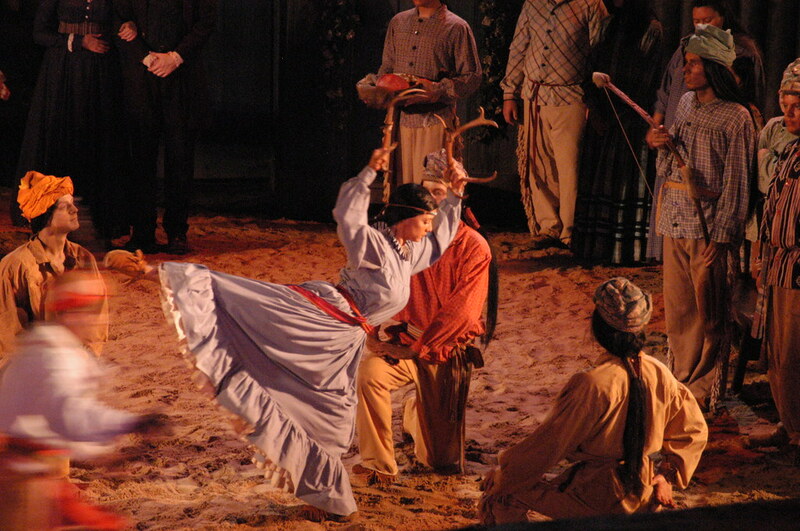 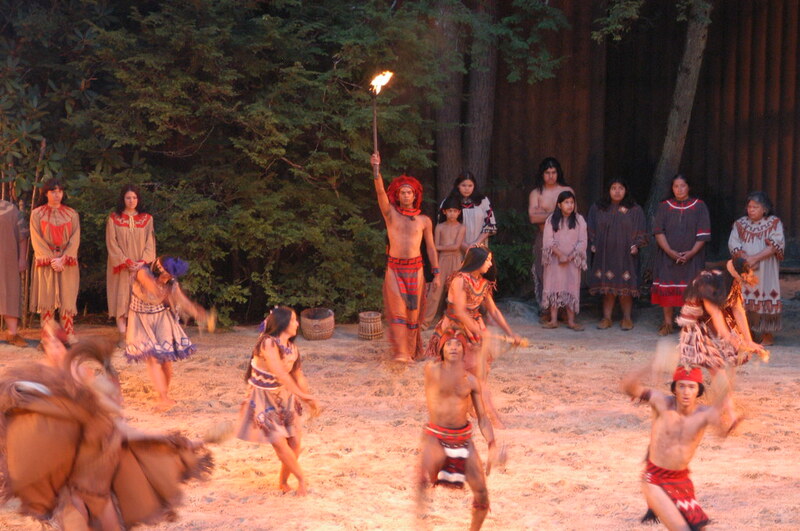 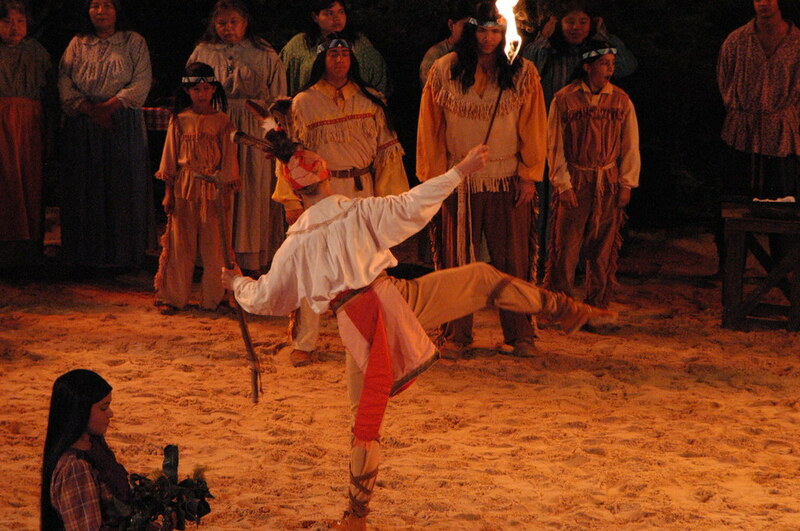 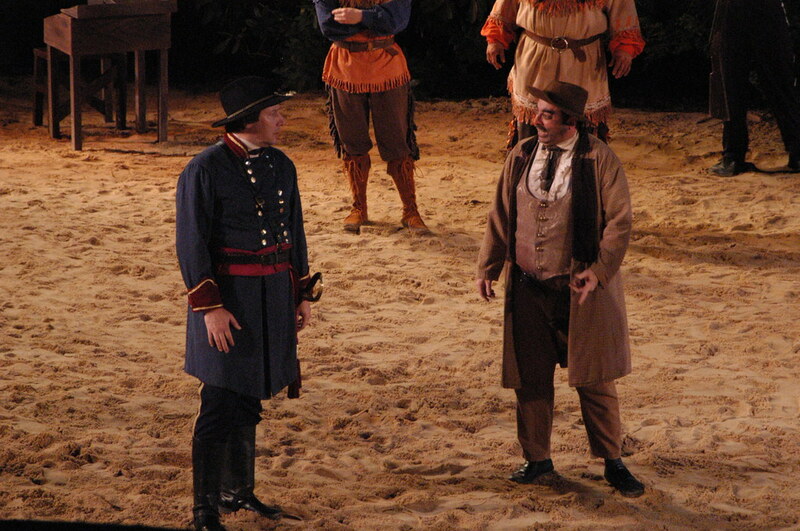 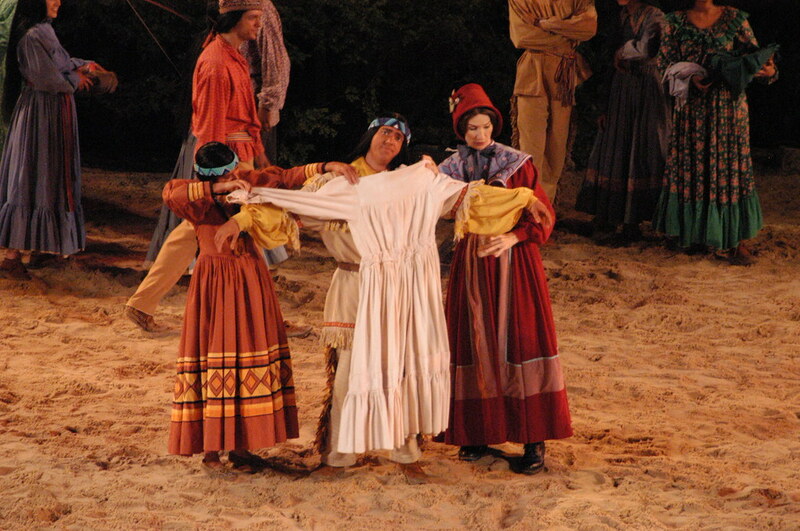 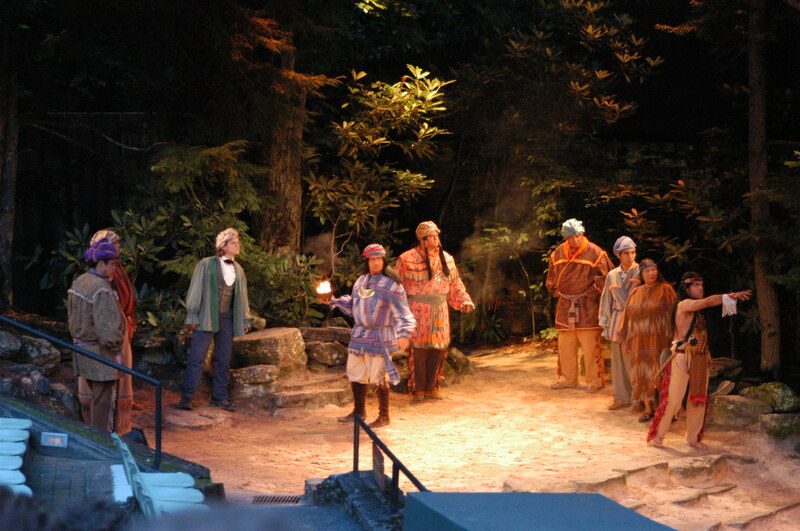 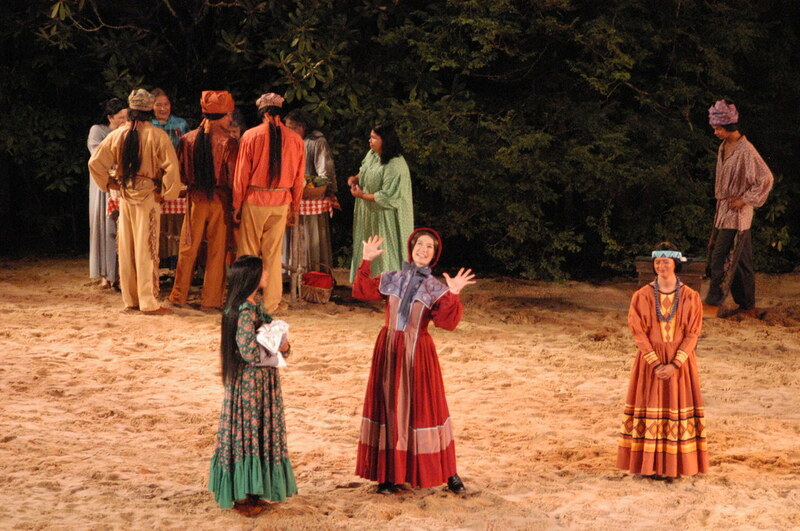 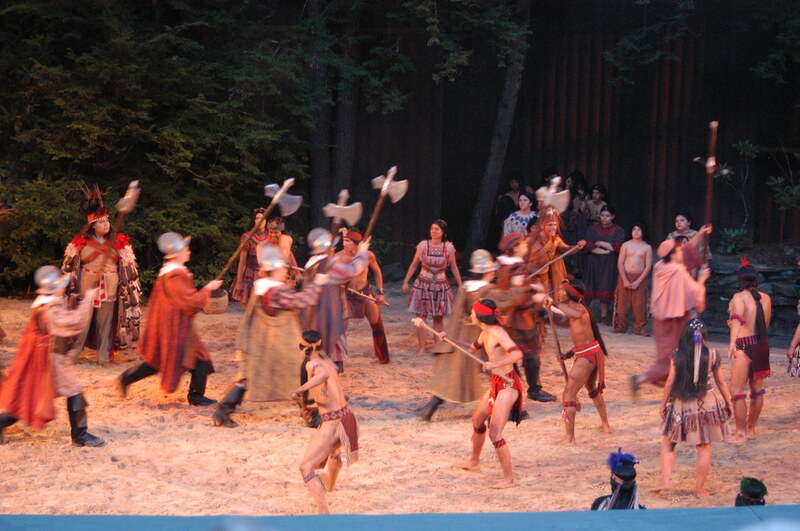 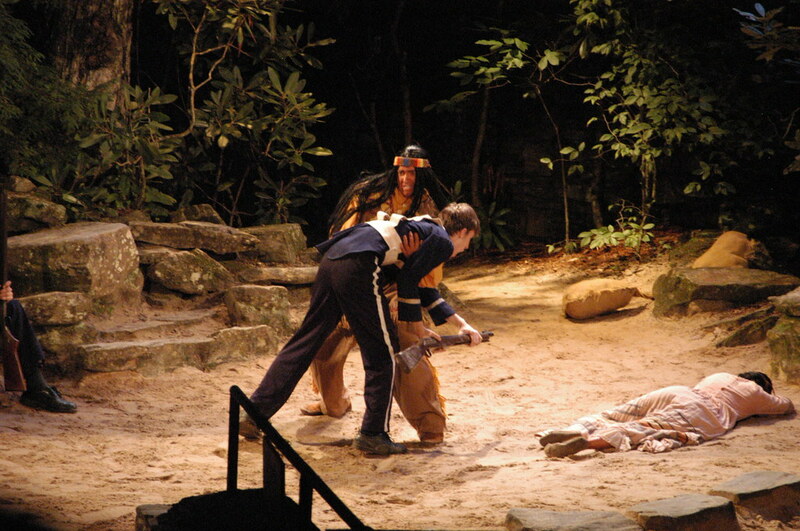 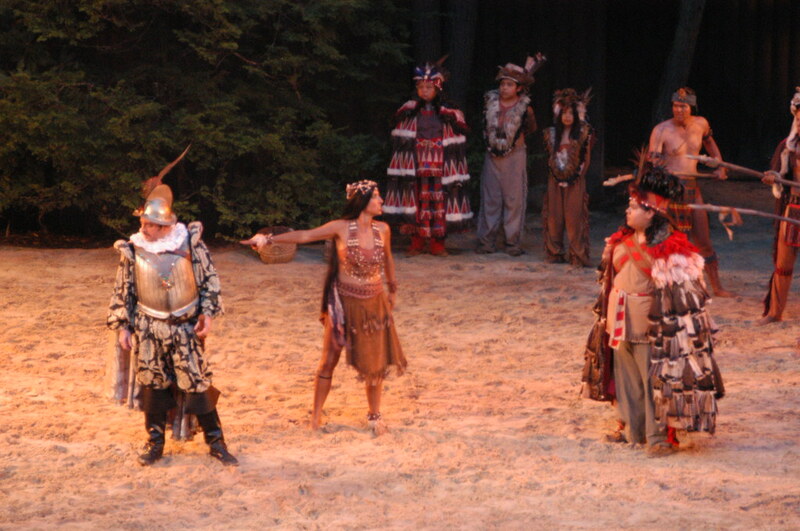 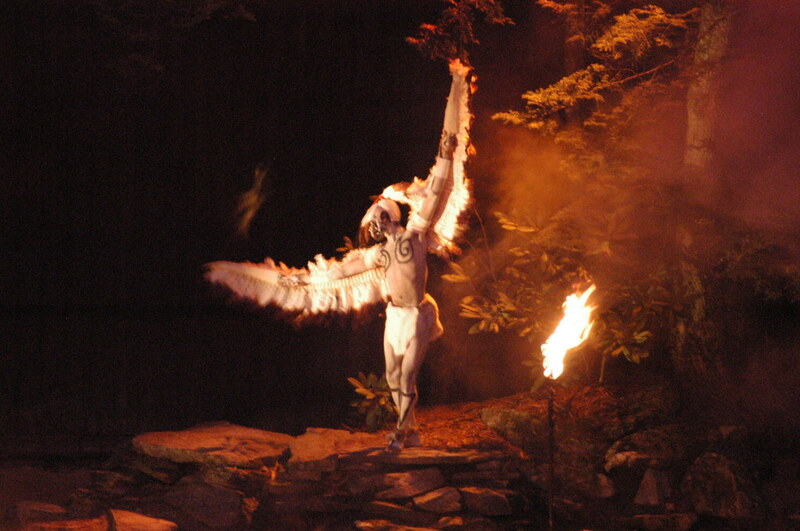 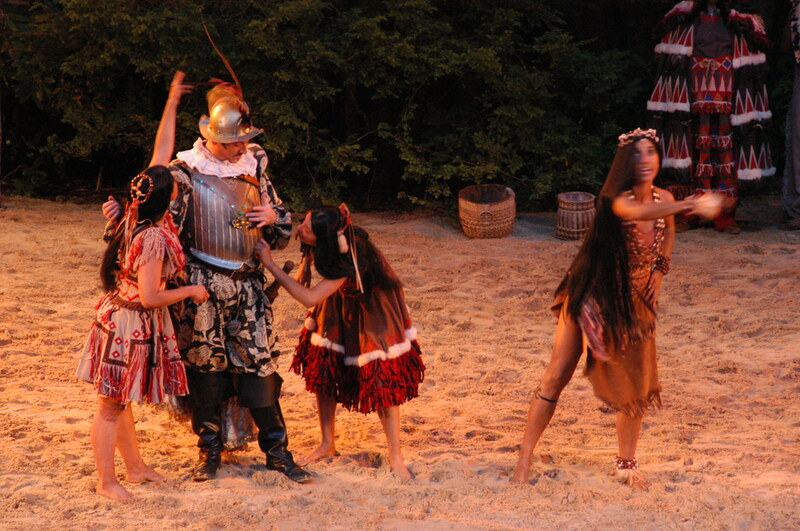 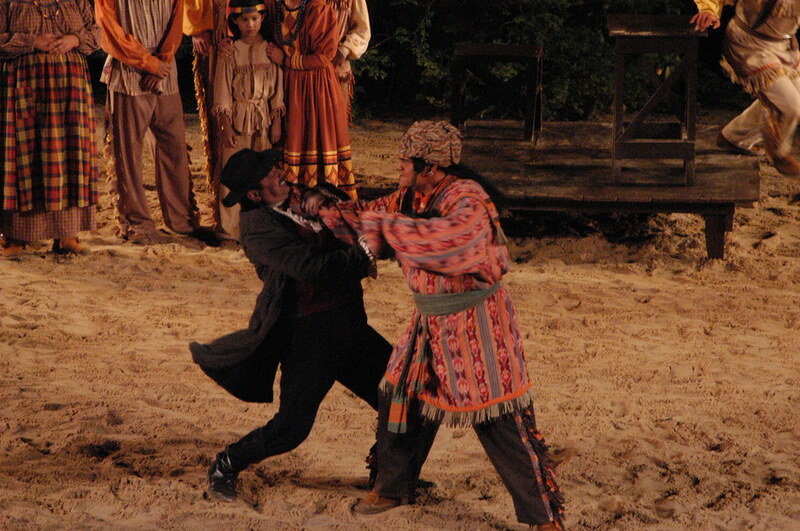 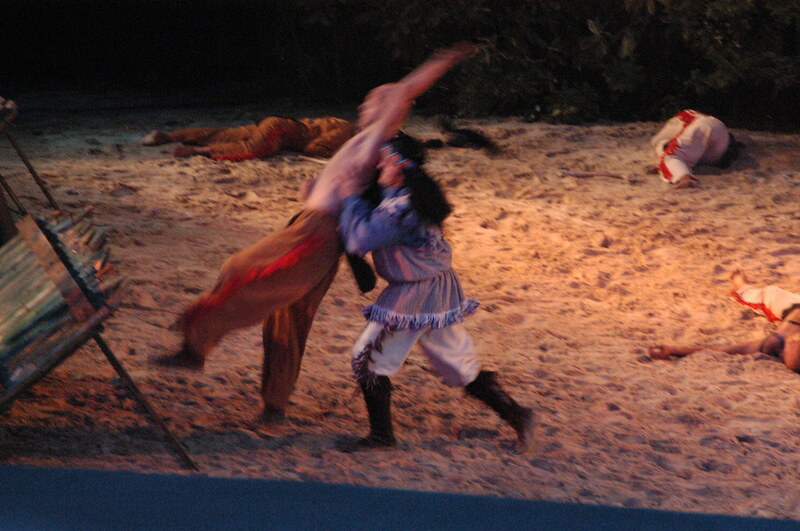 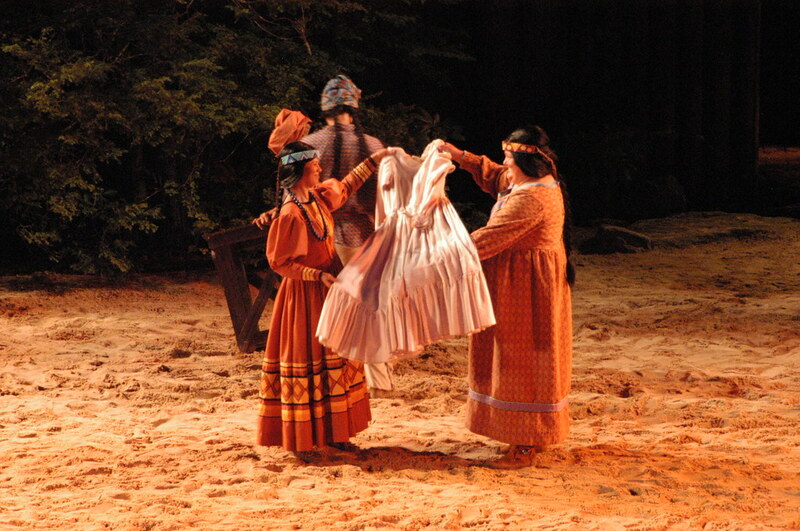 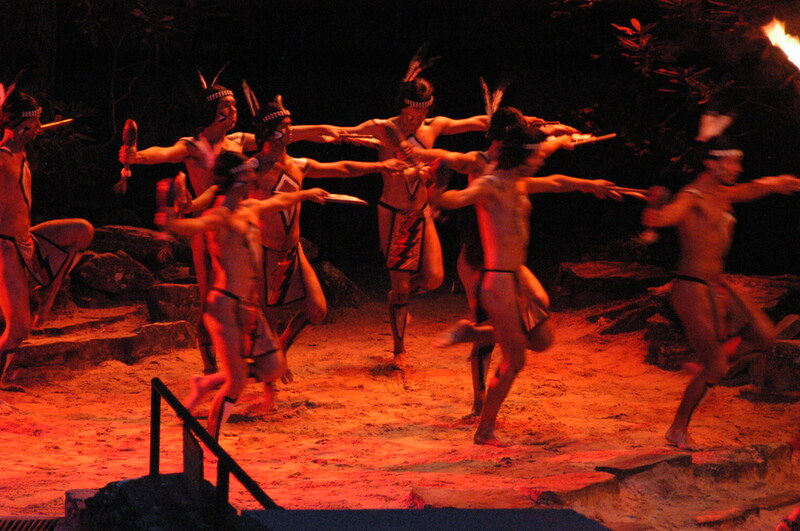 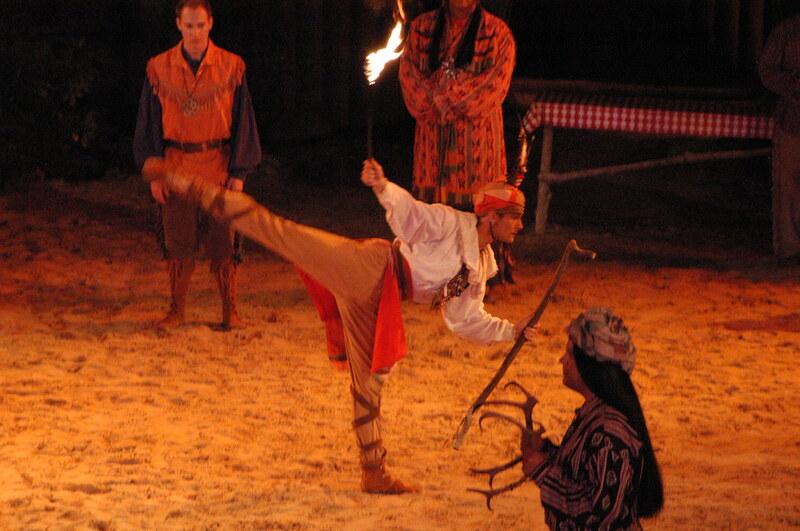 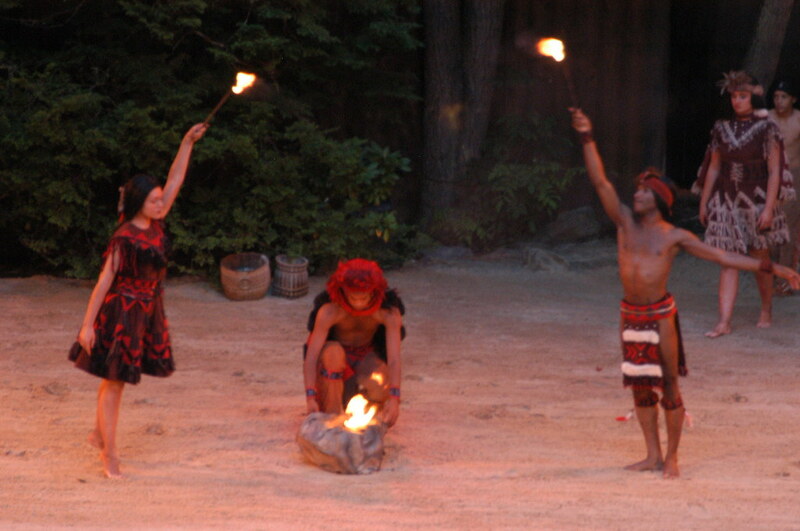 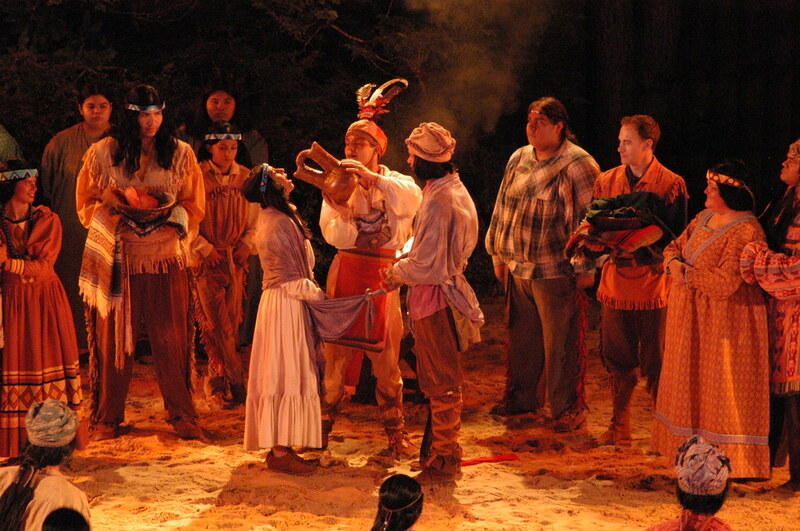 Trip to North Carolina during the Fourth of July weekend to see the popular dramatic presentation of the Cherokee Indians. 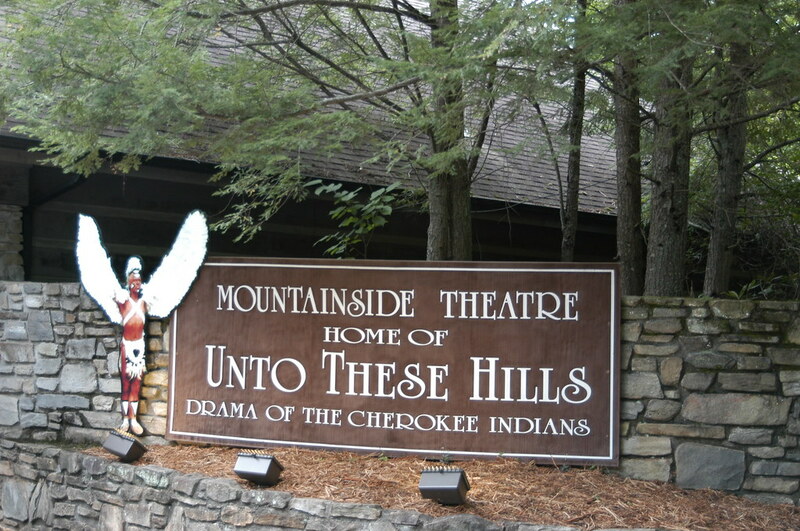 Unto These Hills is set in the early 19th century. 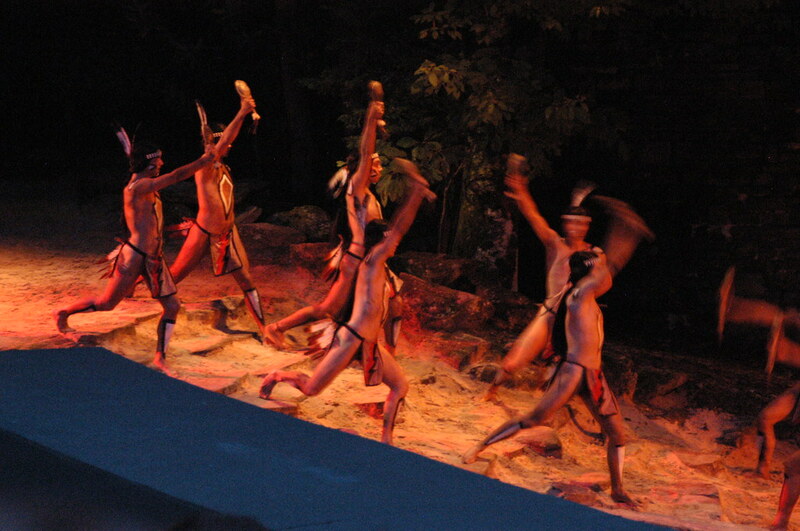 The outdoor amphitheater site was chosen in 1947. 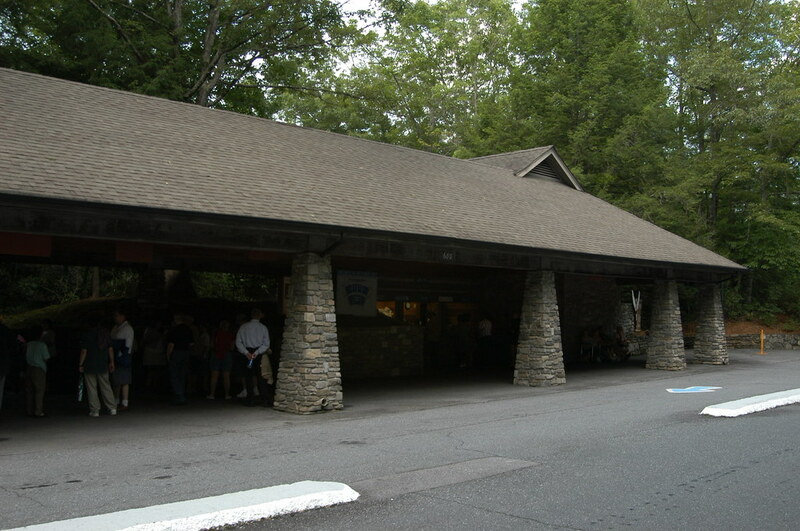 It was a quiet location, sheltered from traffic noise. 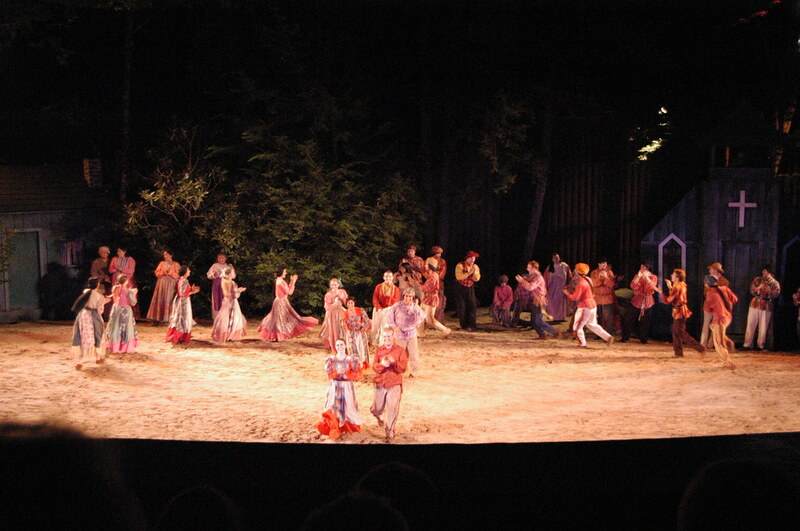 It provided a natural bowl with excellent acoustics. 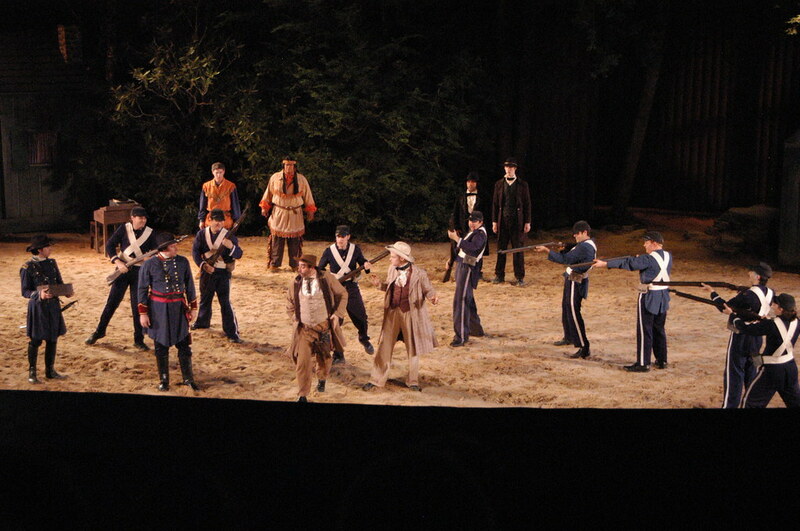 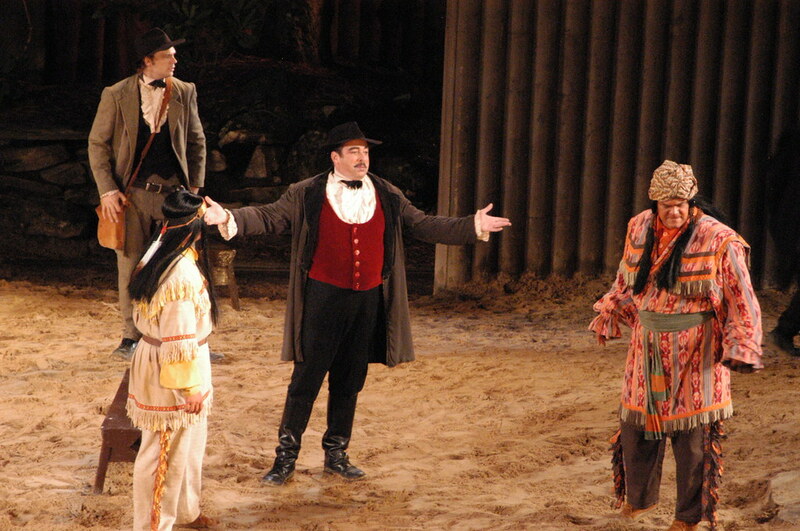 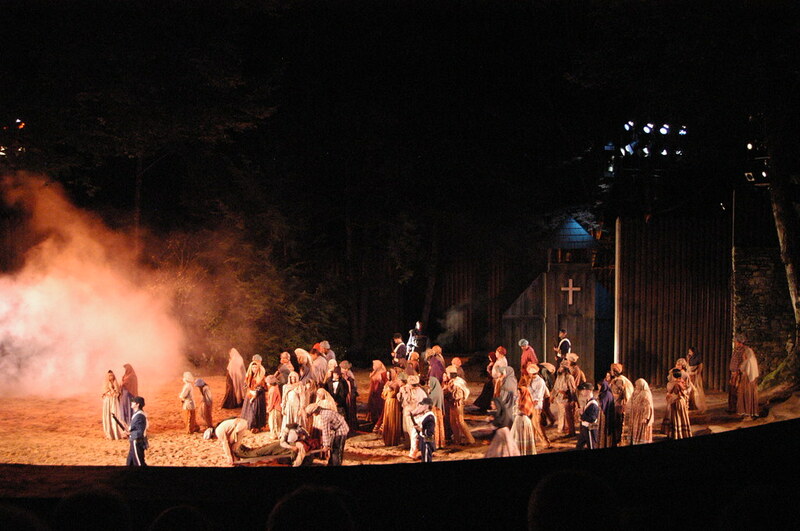 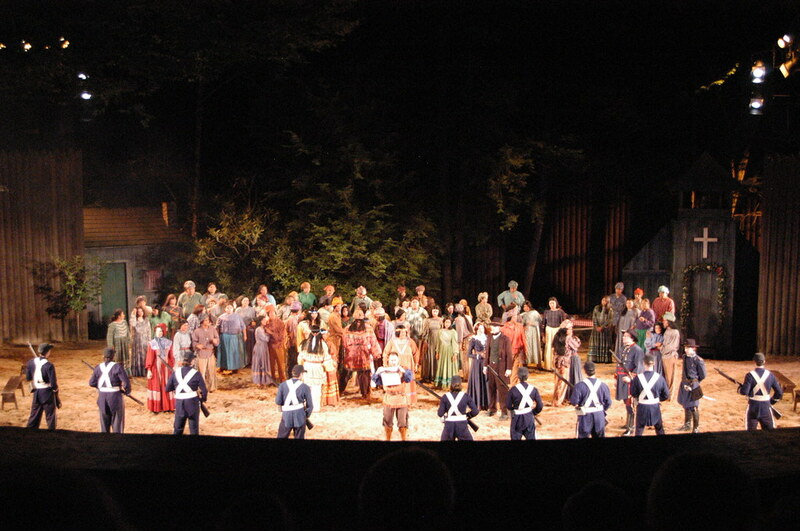 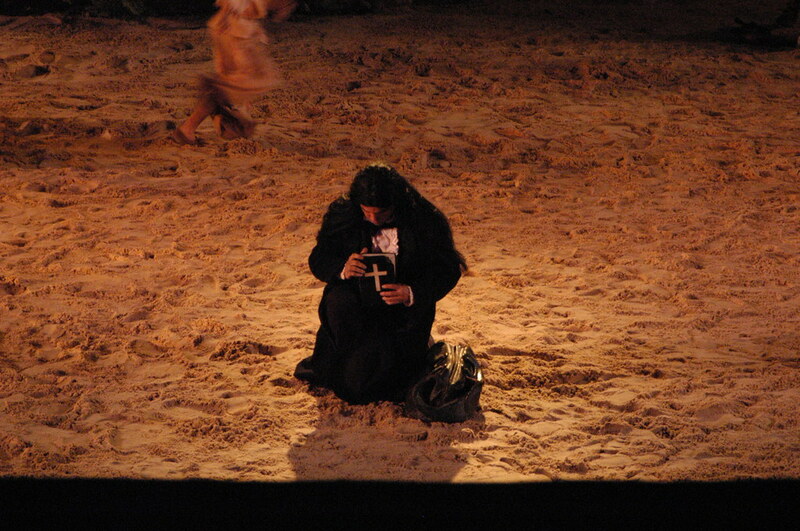 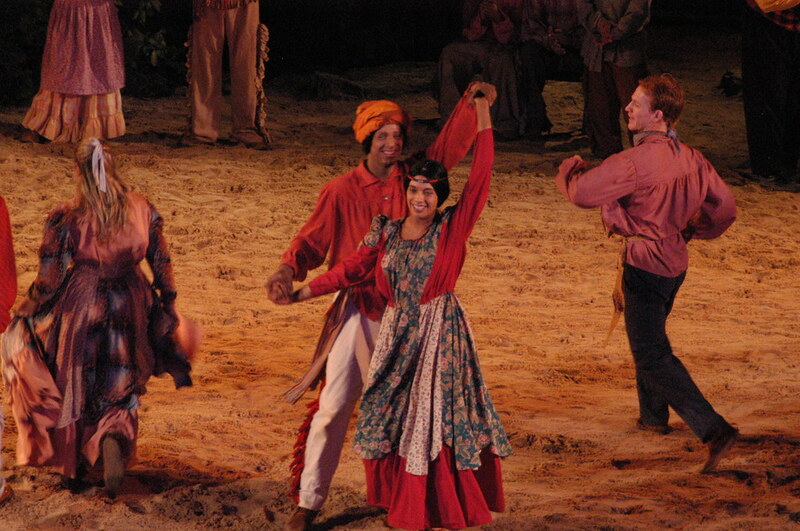 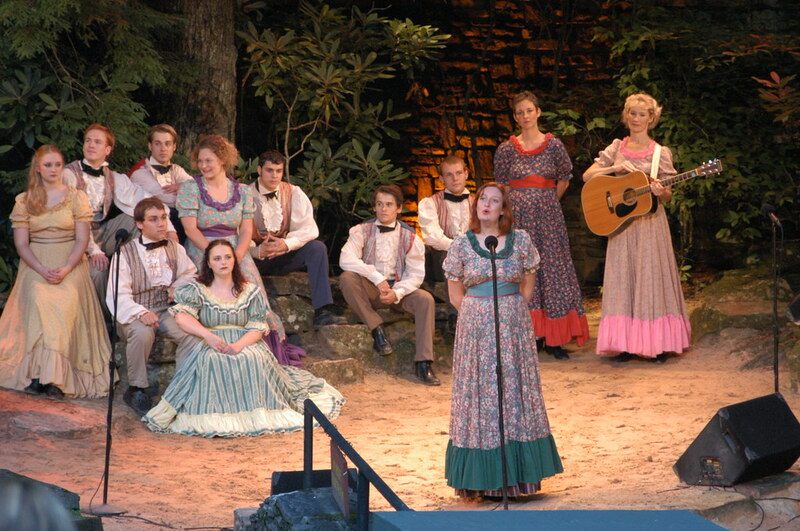 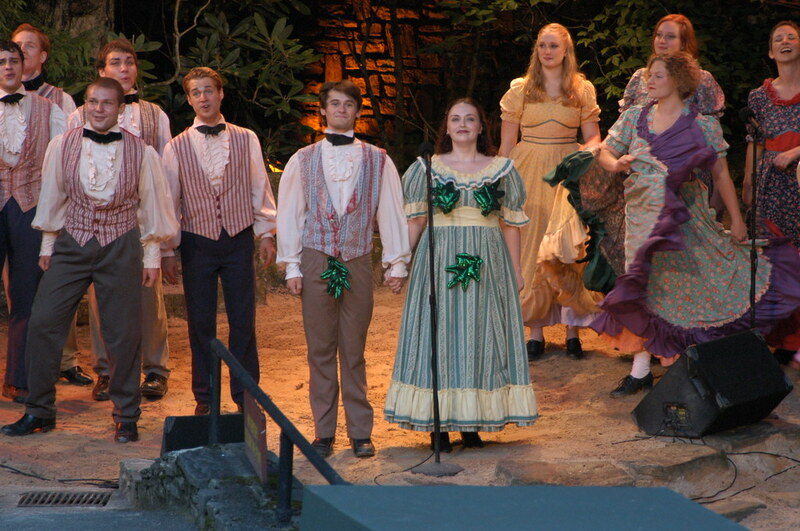 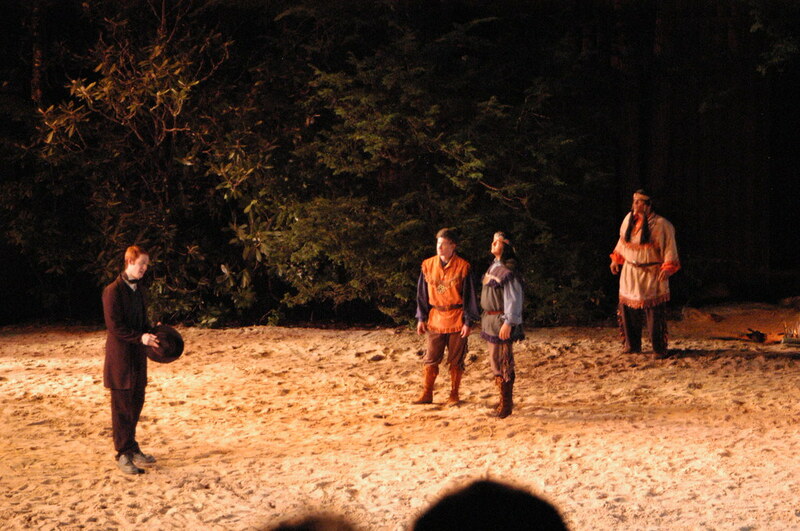 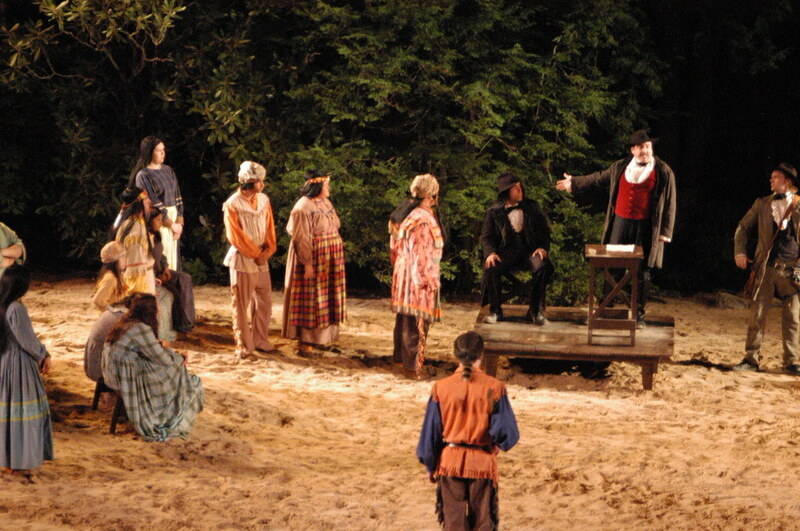 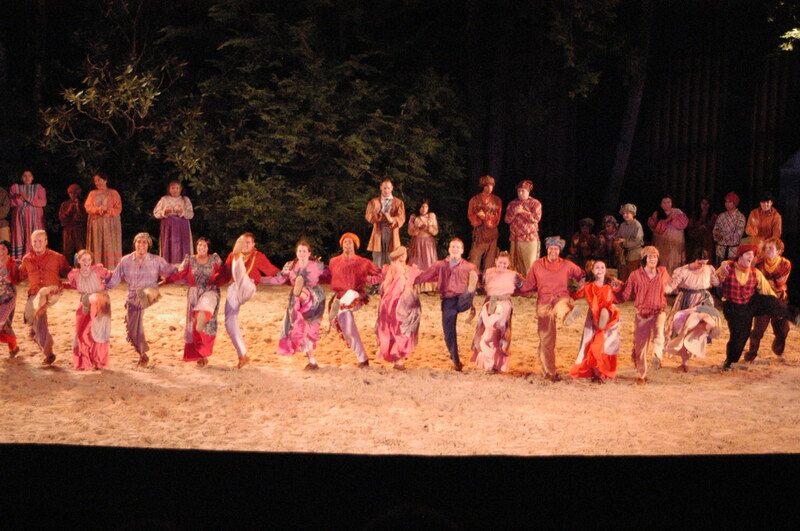 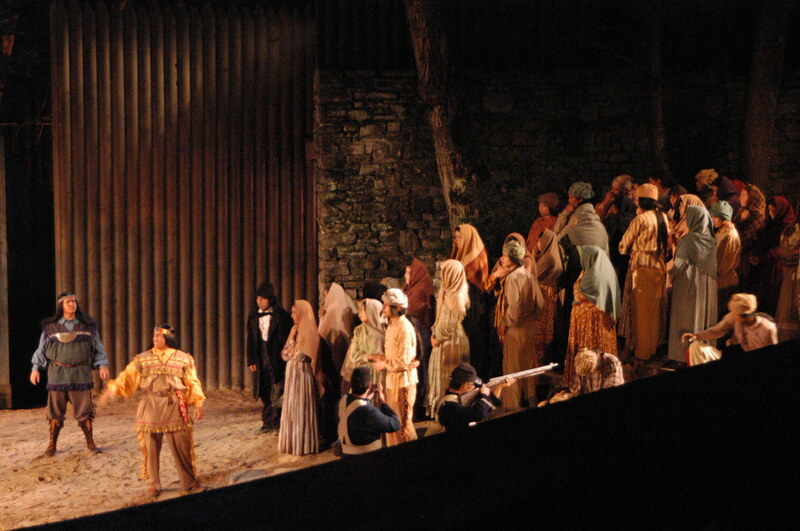 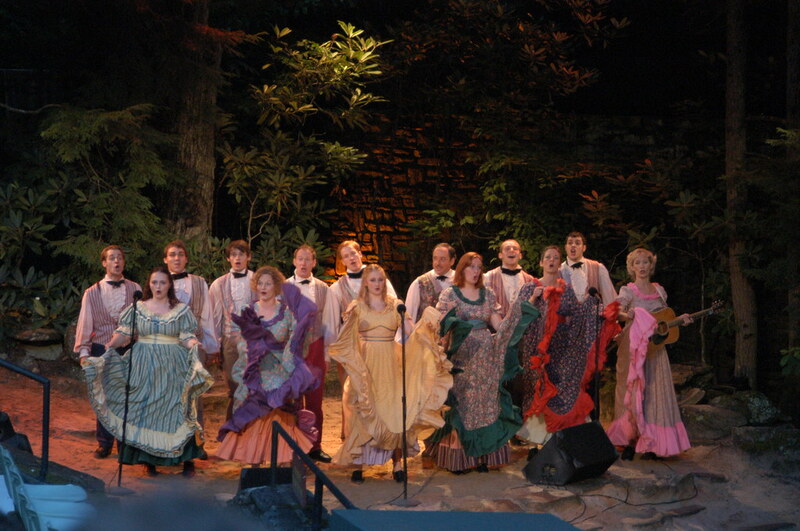 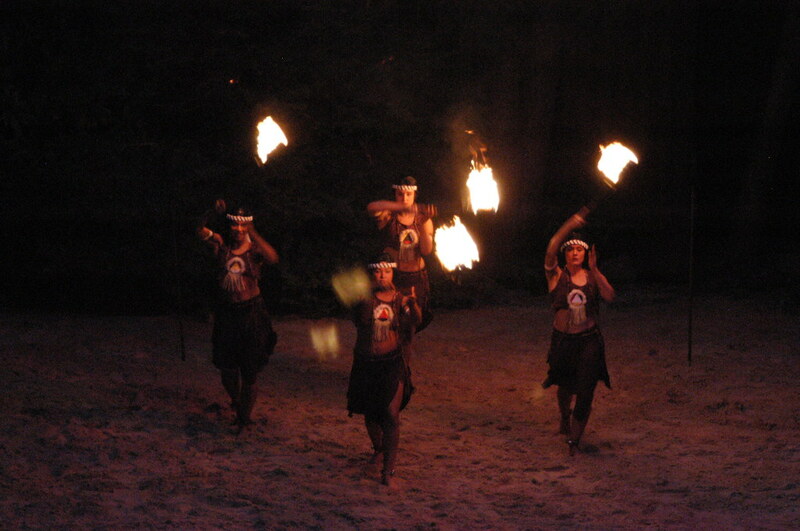 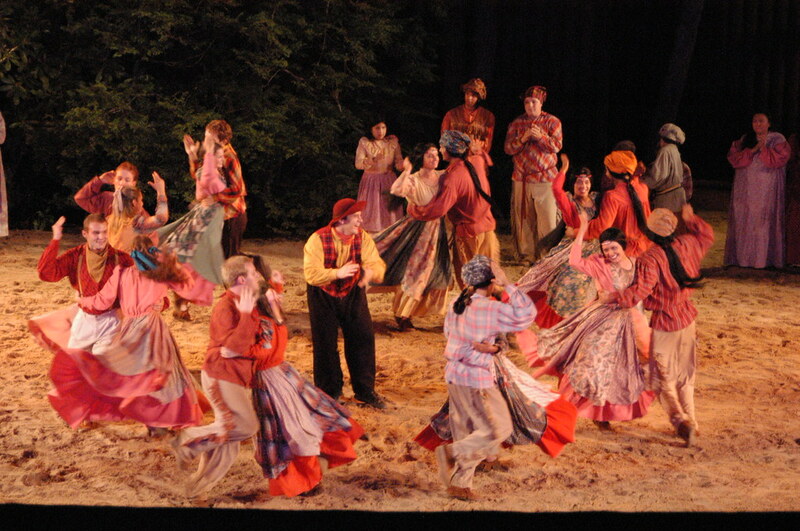 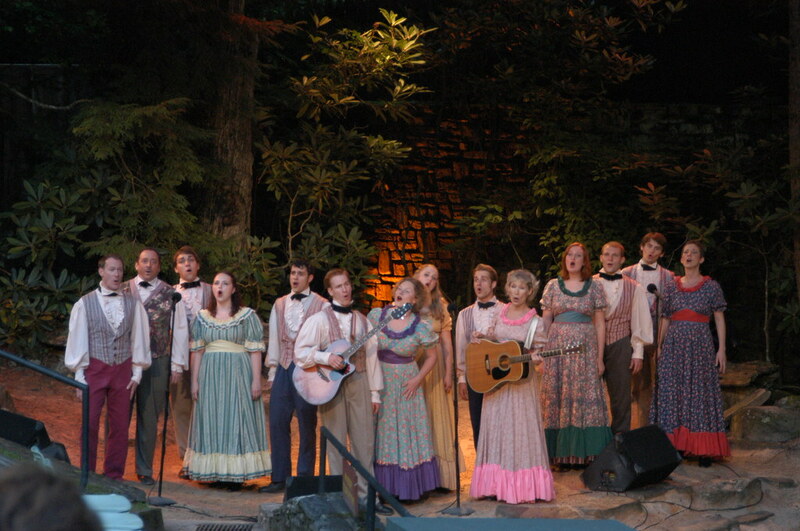 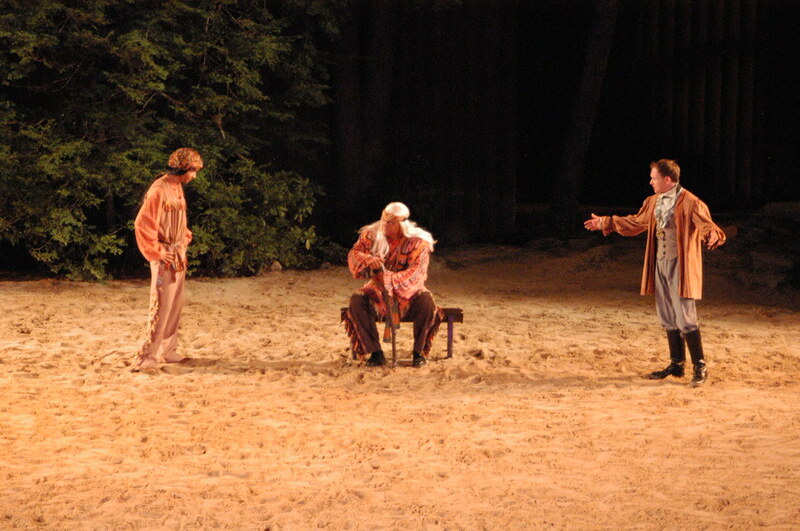 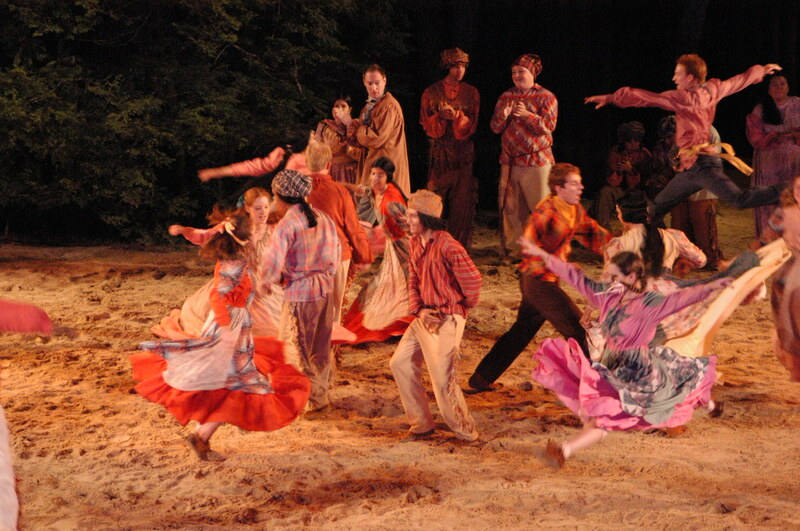 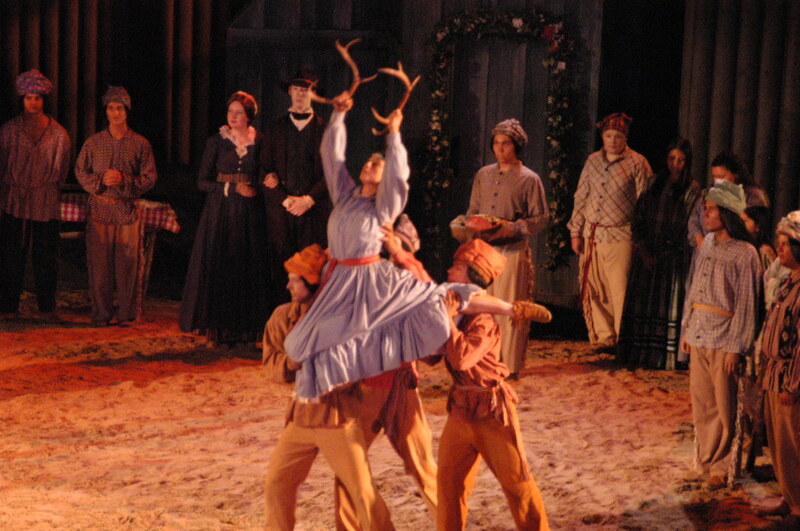 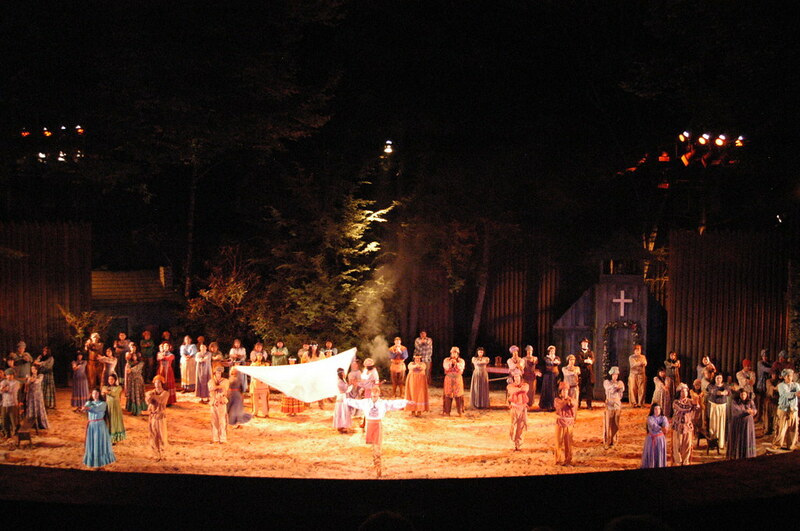 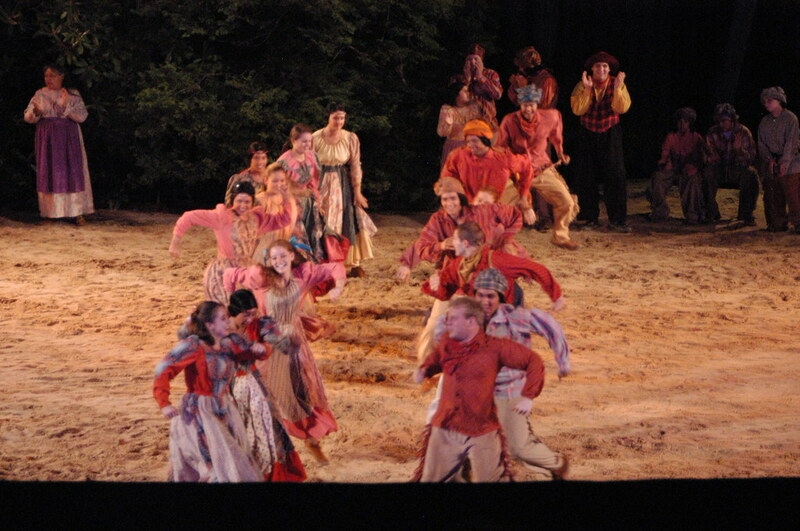 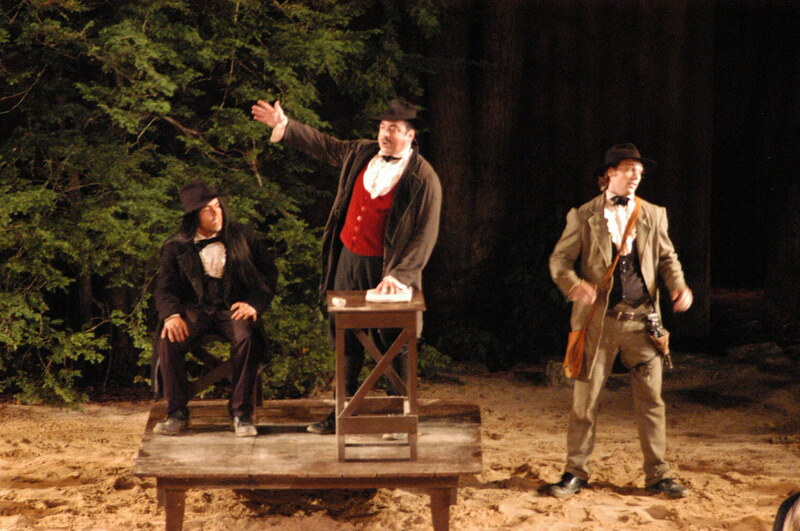 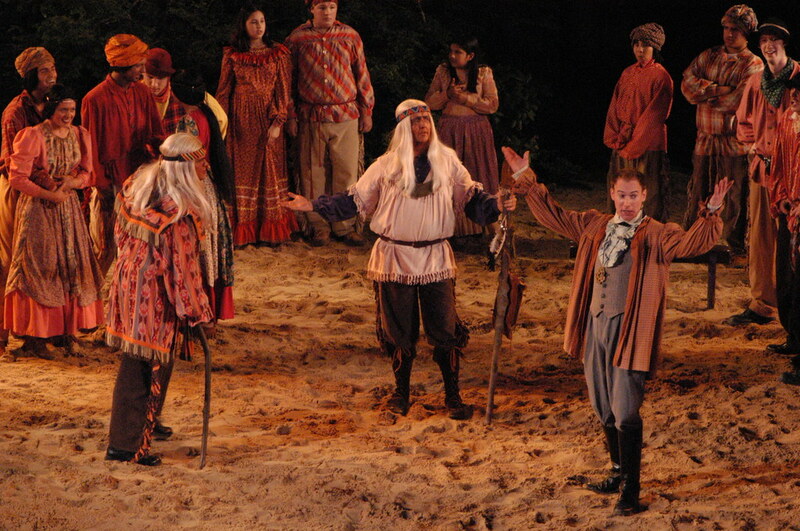 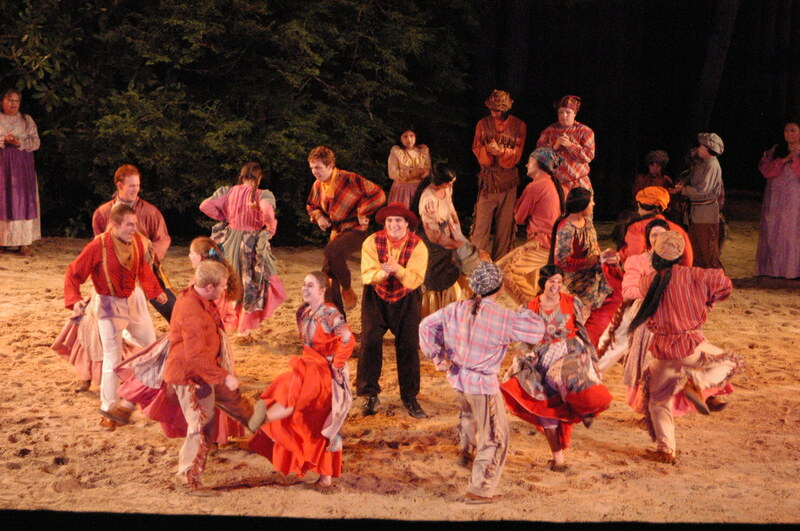 It was protected from the wind, the surrounding vegetation was lush, and the orientation was such that the sun would set behind the audience and the rising moon could provide a backdrop for the play. 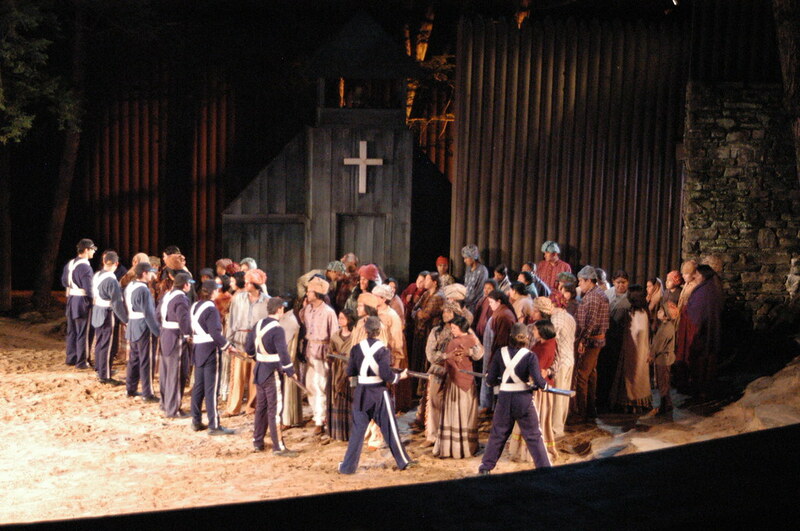 It was large enough for 2,800 seats and minimal earthmoving would be necessary since there was already a primitive road leading to the site. 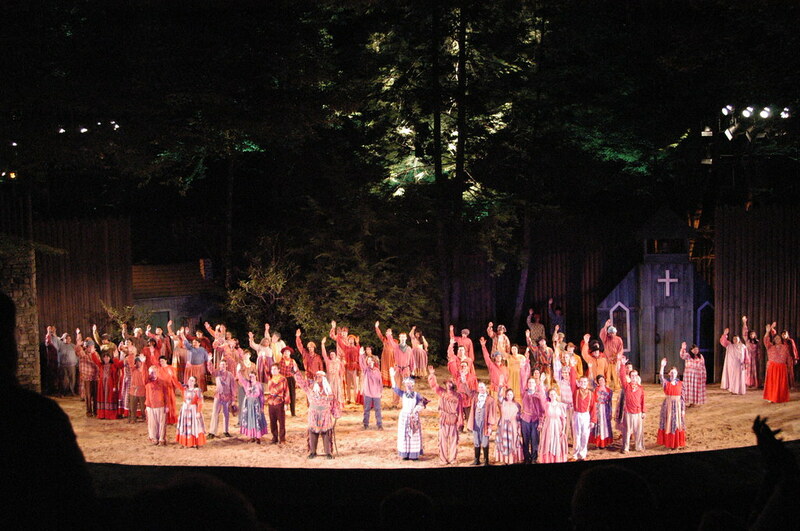 The first performance on the 40- by 160-foot sand stage was on July 1, 1950. 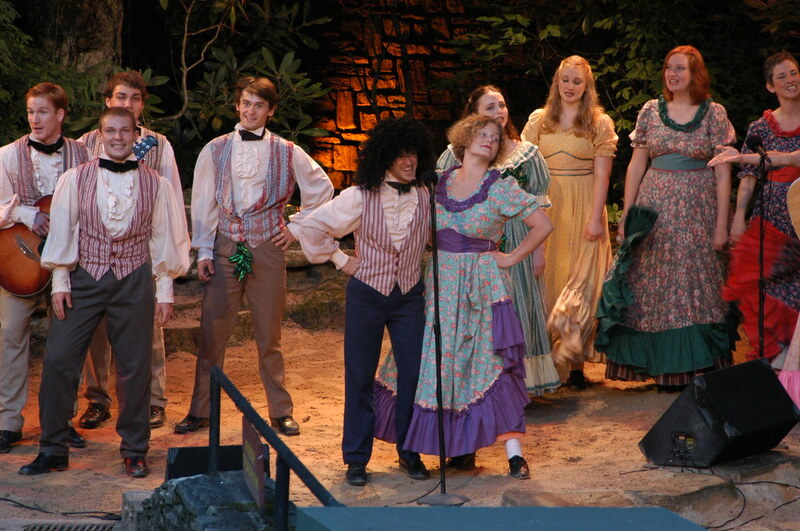 One song was fooling around with various biblical stories, beginning, of course, with Adam and Eve. 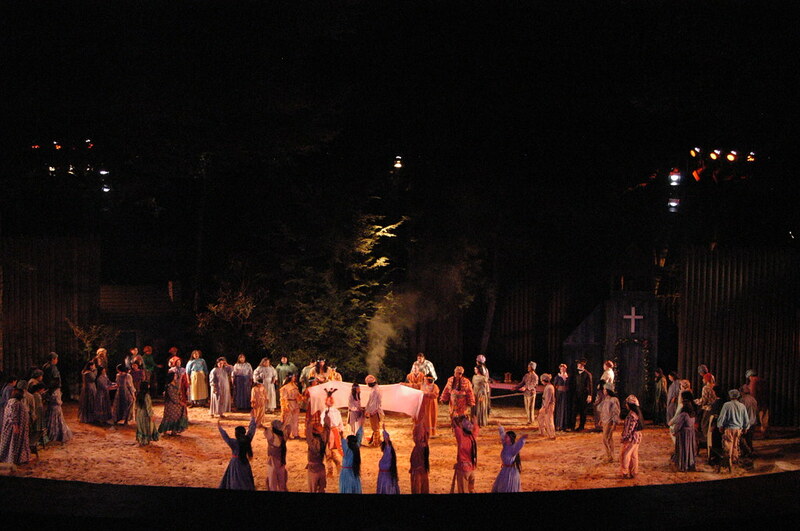 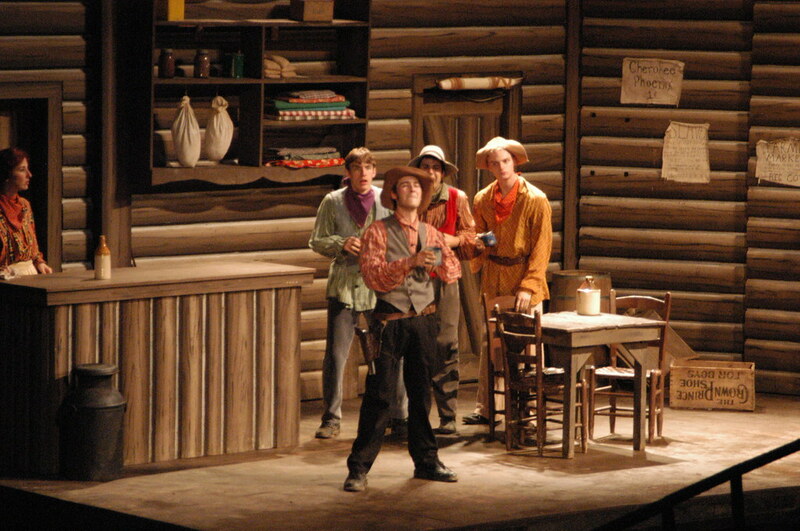 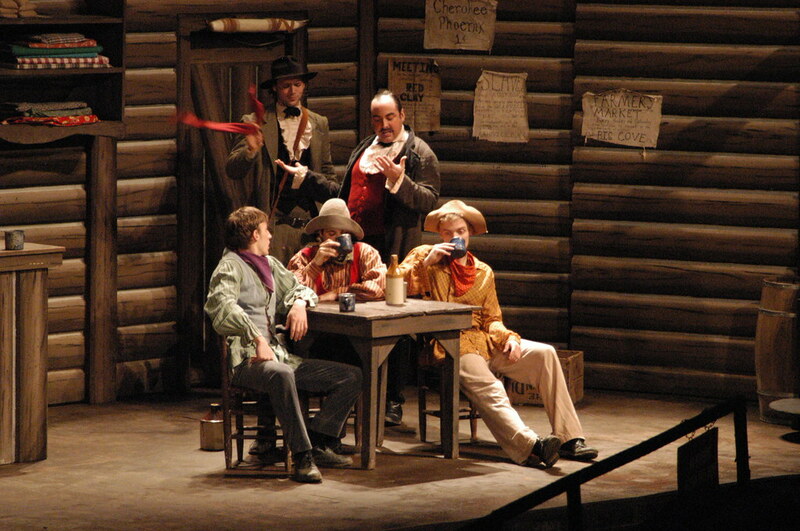 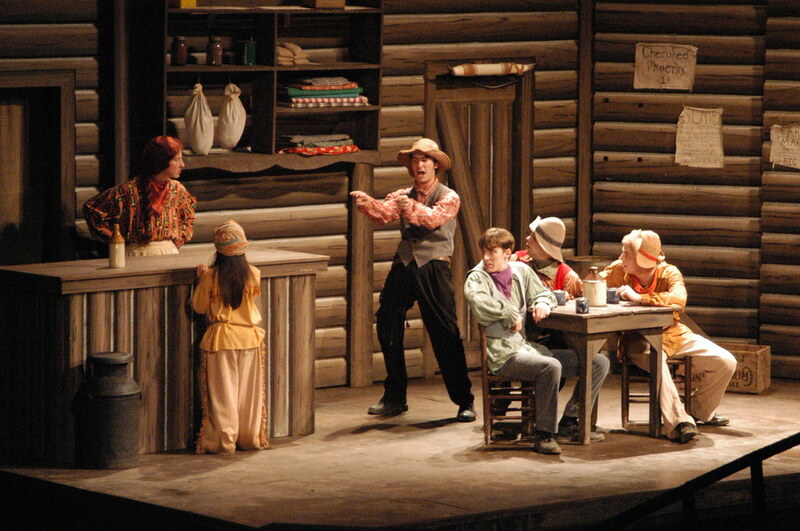 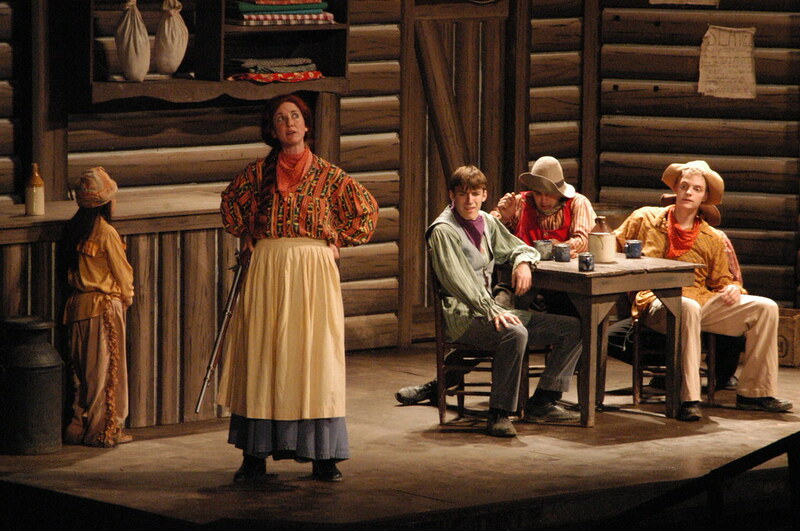 Descriptions for this photo till the end of the set are quotations—with very minor paraphrasing in a few cases—from the scene descriptions found in the 2004 souvenir booklet. 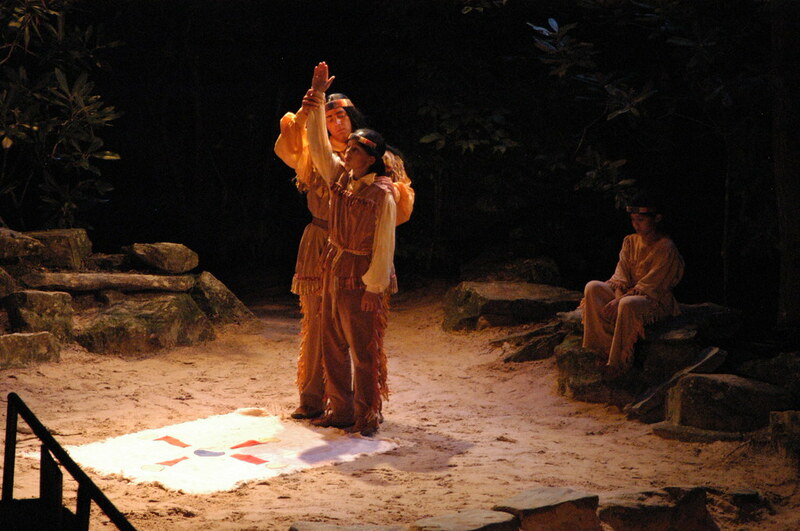 In the beginning was the land. 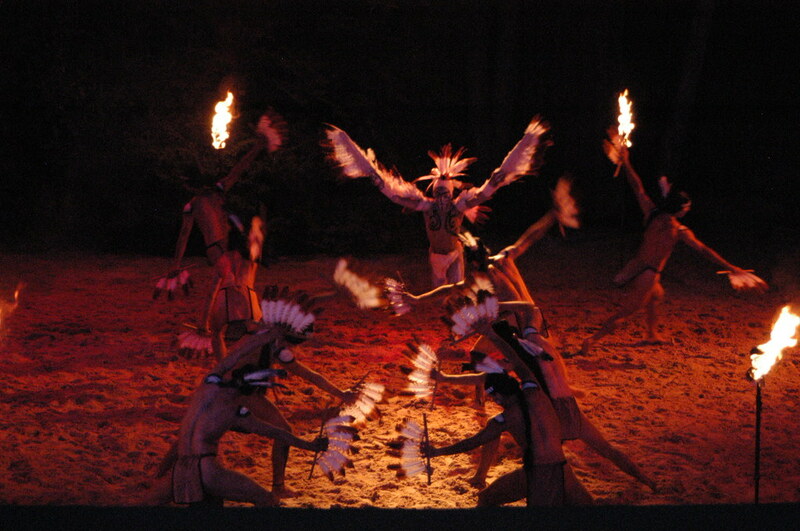 The Cherokee possessed it lovingly. 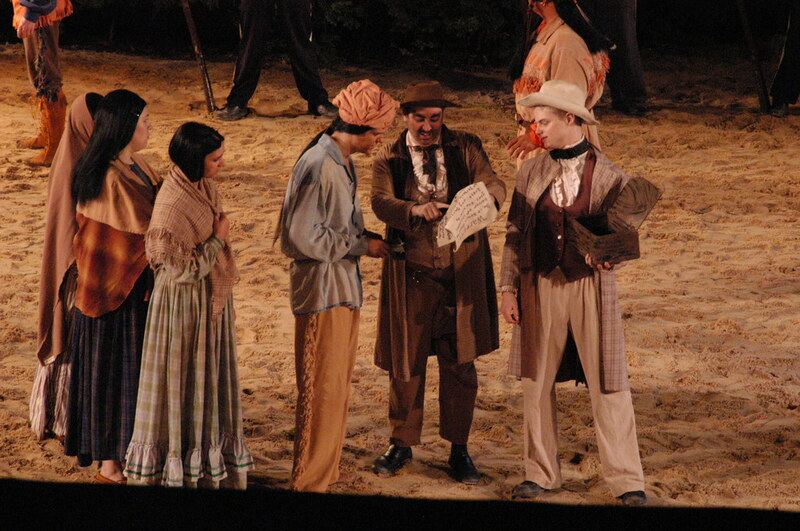 But out of the great sea came a seething tide of explorers and settlers. 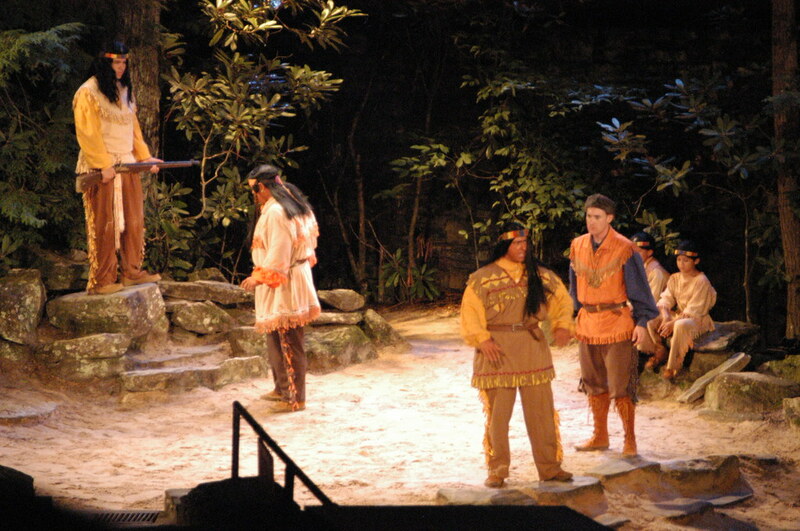 In 1540, the Cherokees encountered their first white men, Spaniards under the leadership of Hernando DeSoto, searching for gold. 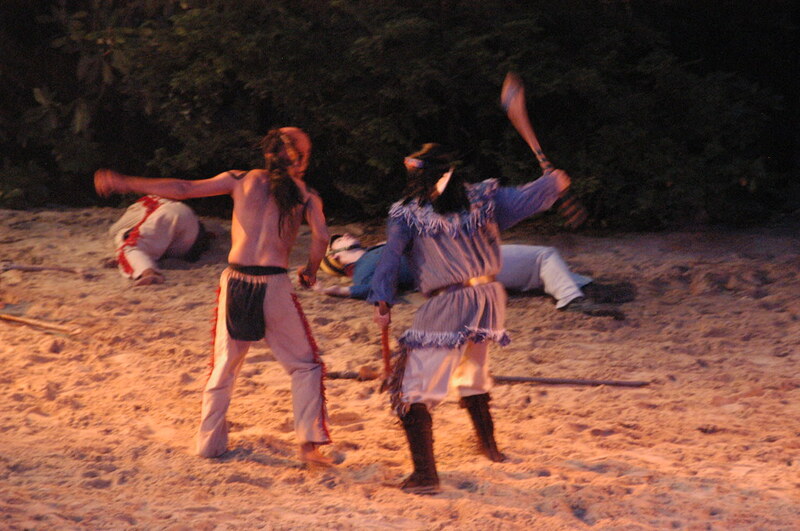 Some 250 years later, the Cherokee were approached by a fiery warrior from the north, Tecumseh, who urged them to join in war against the white men. 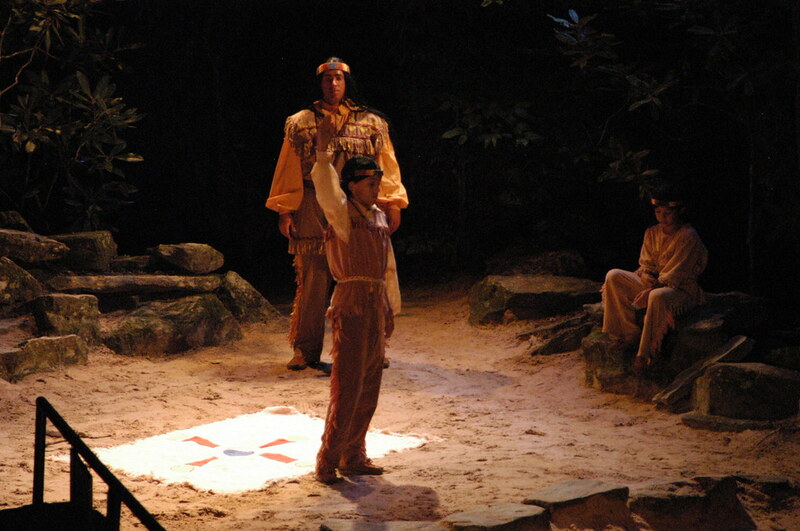 …the Cherokee decided to try to live in peace with the white men. 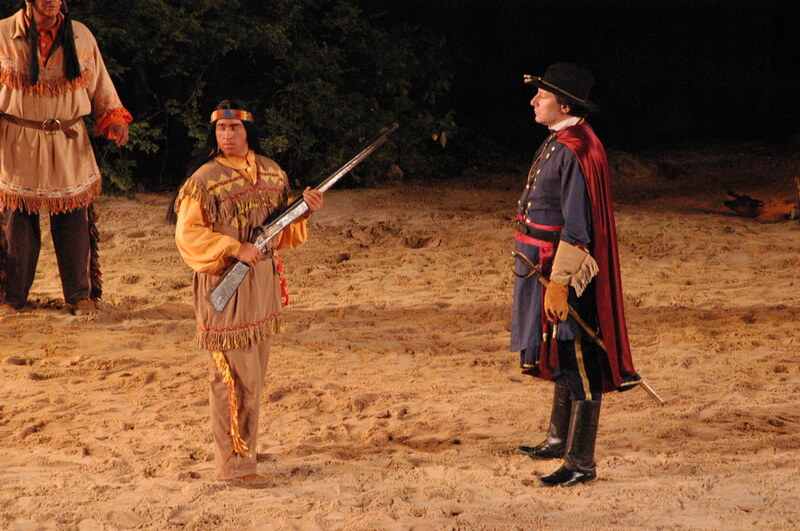 The Cherokee had finally made their way into the confidence of the white men who called on them for help against the other Indians who threatened the American nation. 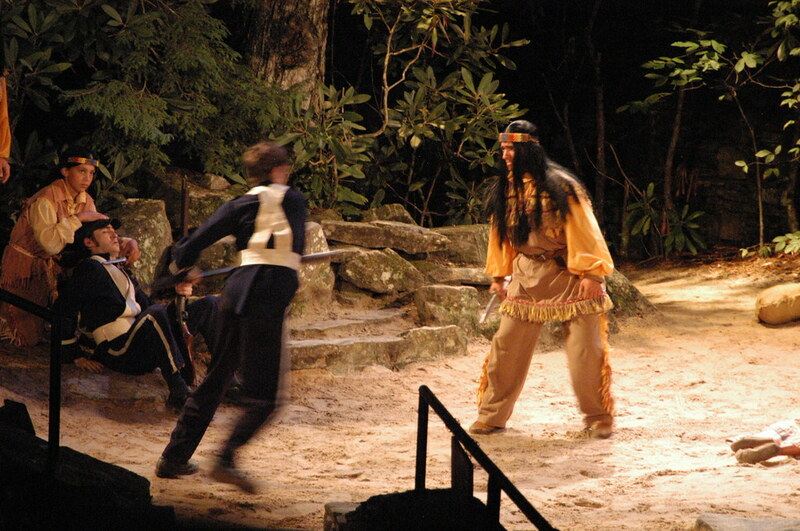 The Cherokees joined General Andrew Jackson at the Battle of Horseshoe Bend in 1814. 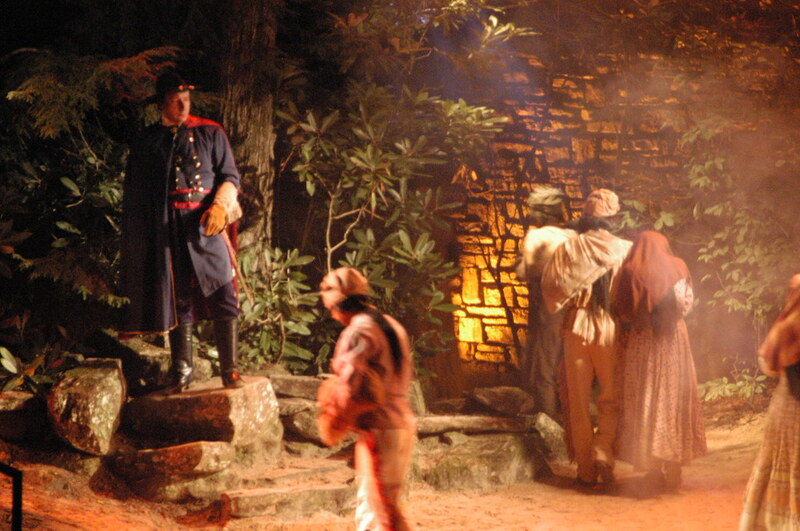 During this battle, Chief Junaluska saved the life of Andrew Jackson. 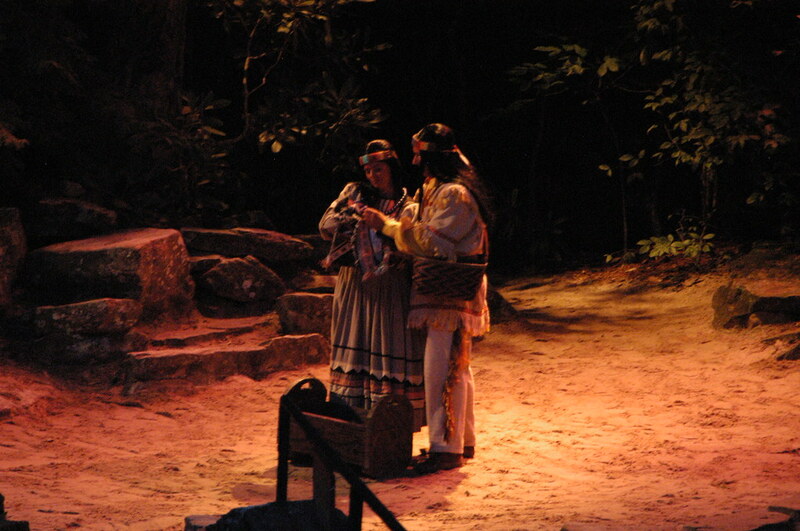 Following victory at Horseshoe Bend, the Cherokee headed home to the Great Smokies. 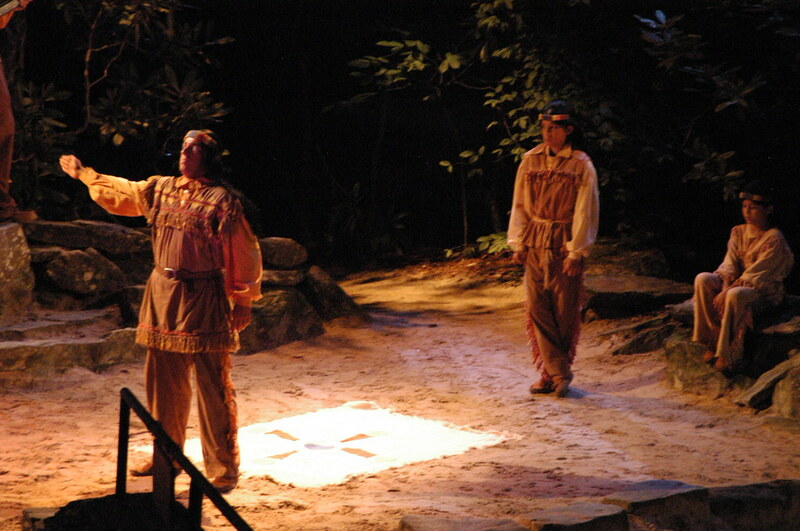 Among those returning was Tsali, the Cherokee who would later give his life so that a handful of his people could remain in the land of their birth. 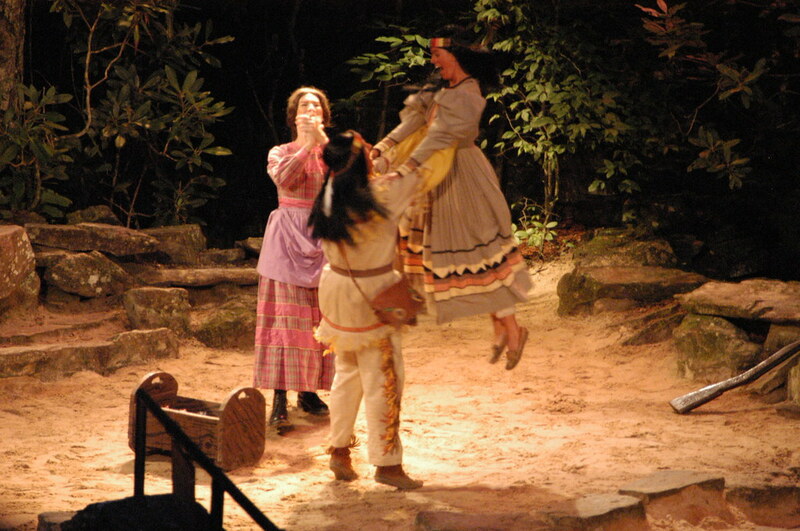 Through the Cherokee nation swept a wave of rejoicing, and Indians and whites gathered to celebrate the great victory. 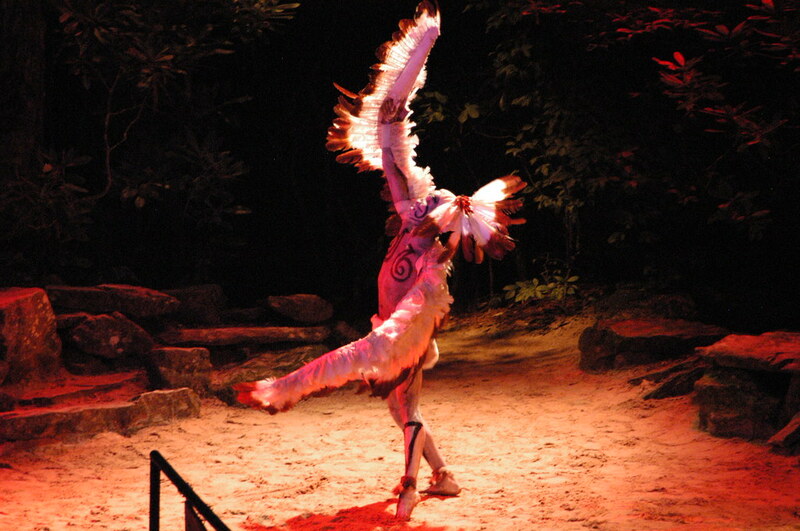 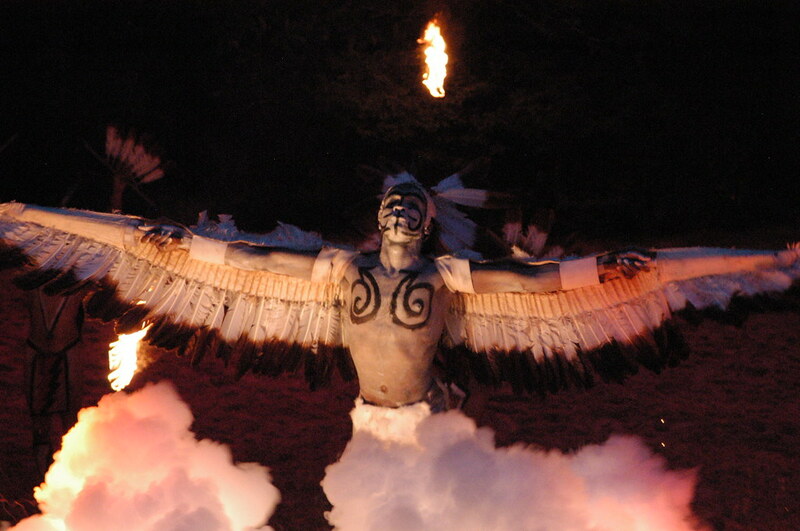 In the Great Smokies, the Cherokee reached far into the past and brought back a dance of triumph—the Great Eagle Dance. 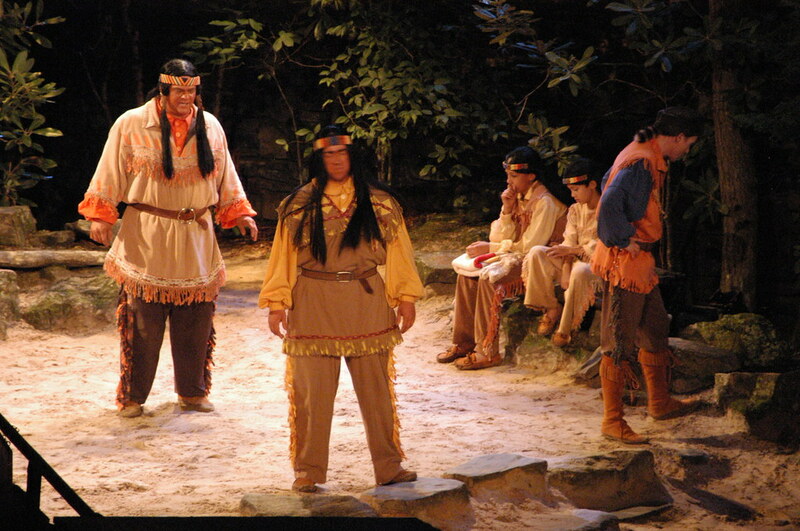 The hopes of the Cherokee were crushed by the increasing tide of white settlers. 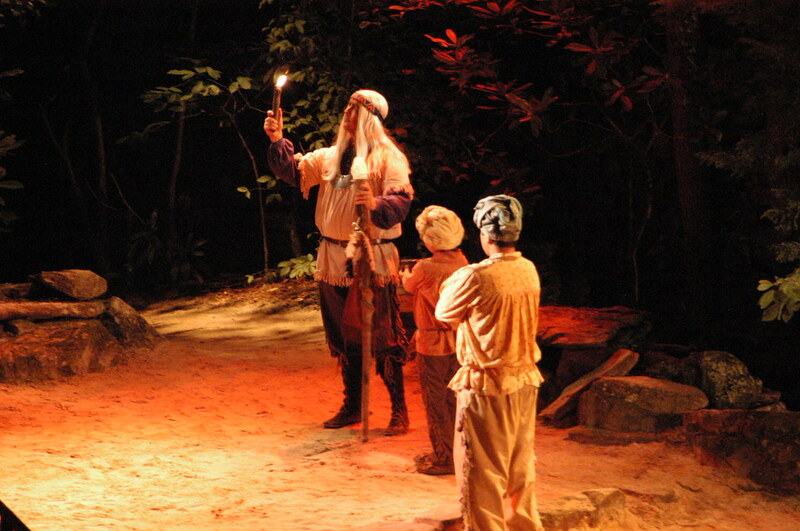 Storm broke over the land when gold was discovered in north Georgia. 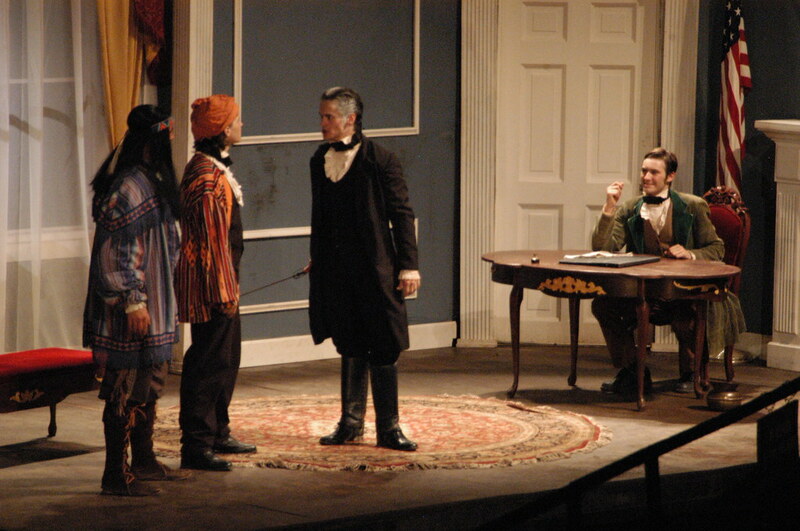 And then there appeared the Reverend Schermerhorn, sent by the U.S. government to negotiate with the Cherokee leaders for a treaty to move the Cherokee to Indian territory in the west. 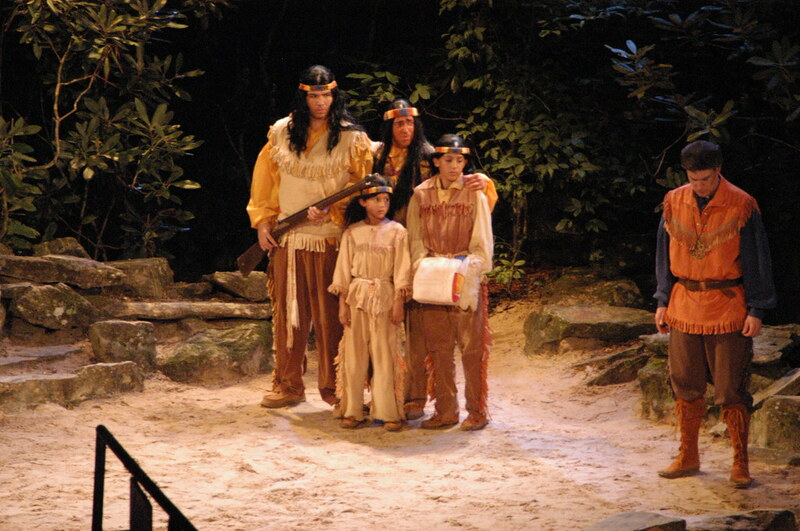 Reverend Schermerhorn gathered a handful of the Cherokee together and persuaded them to sign a treaty—which none could read or understand—giving away their lands. 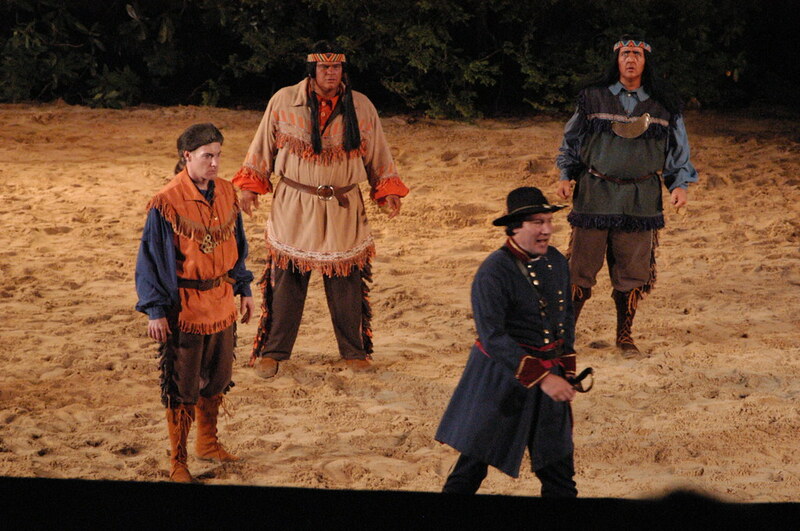 All the while, their chiefs were away in Washington, D.C., urging the government to let their people remain in their homeland. 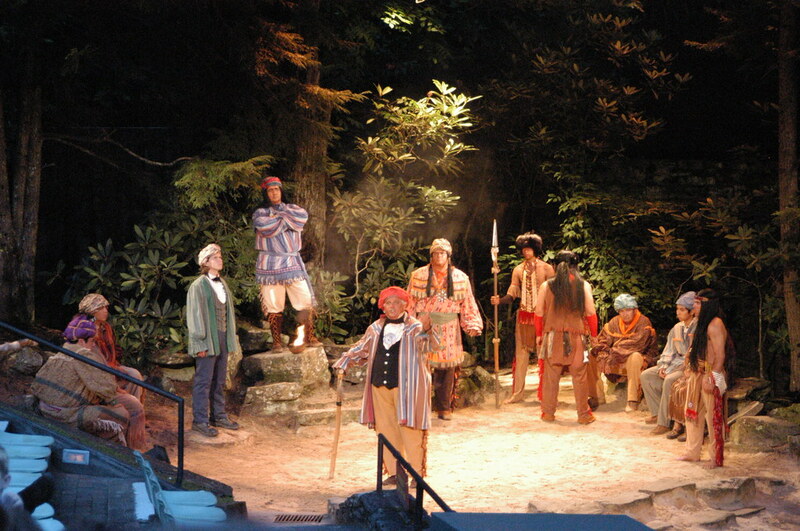 Reverend Schermerhorn refused to explain the treaty to Drowning Bear, the only chief who remained in the hills. 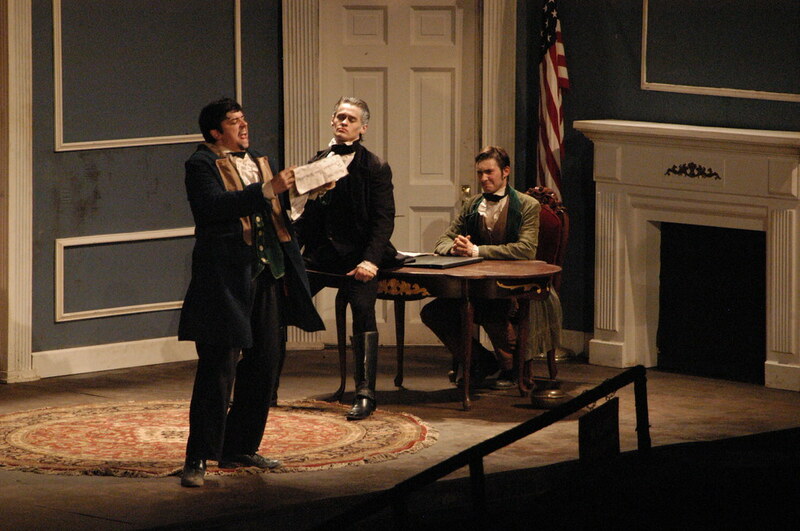 In the year 1835, there was one big political party with President Andrew Jackson in power. 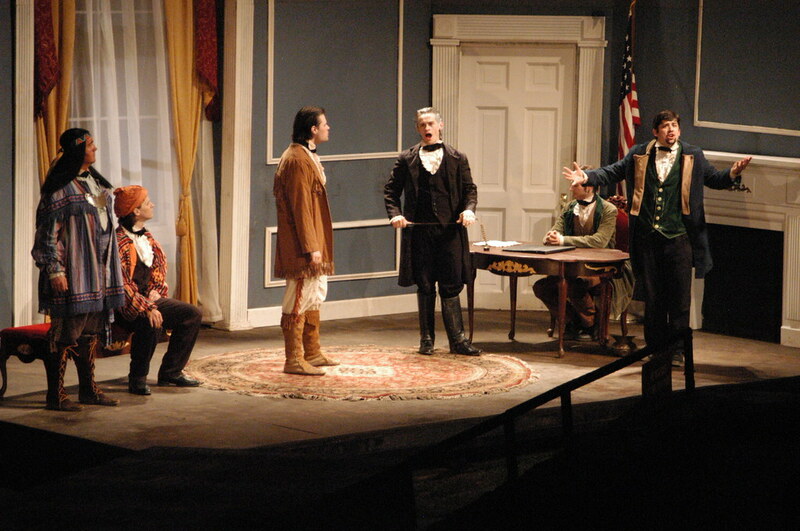 There was talk of states' rights and the slave question, and no one had time to think about the Indian question. 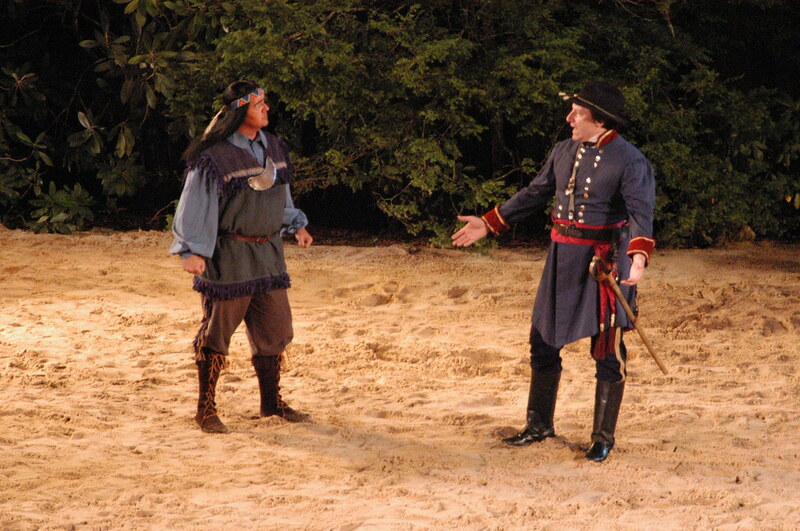 Junaluska visited in the White House to plead for the Cherokee to his old friend "Andy" Jackson, but, Jackson turned his back on the man who had saved his life at Horseshoe bend. 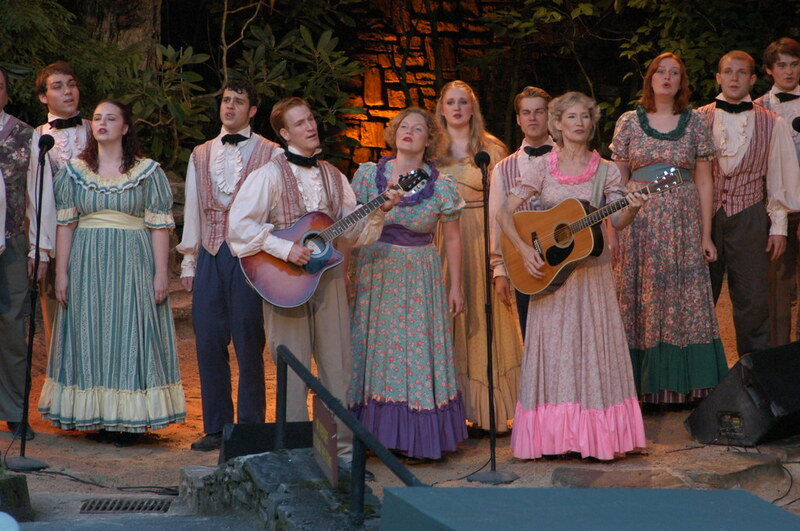 In the Smokies, life went on. 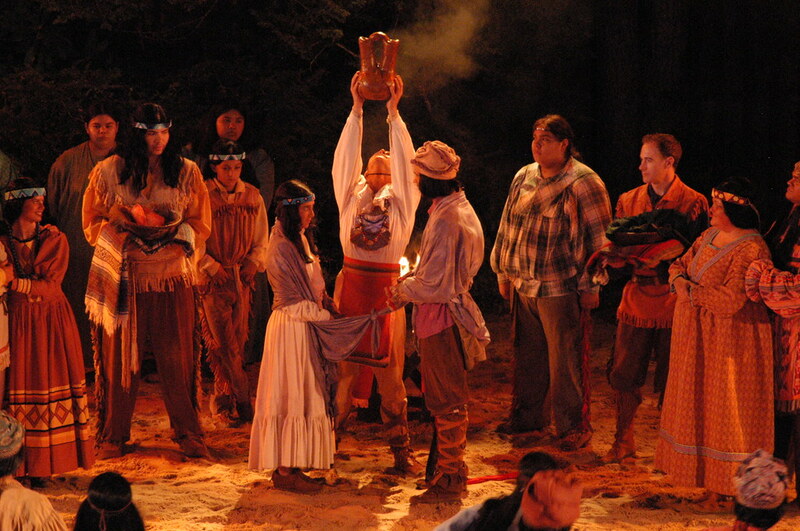 A party was gathering for the wedding of Nundayeli, daughter of Tsali. 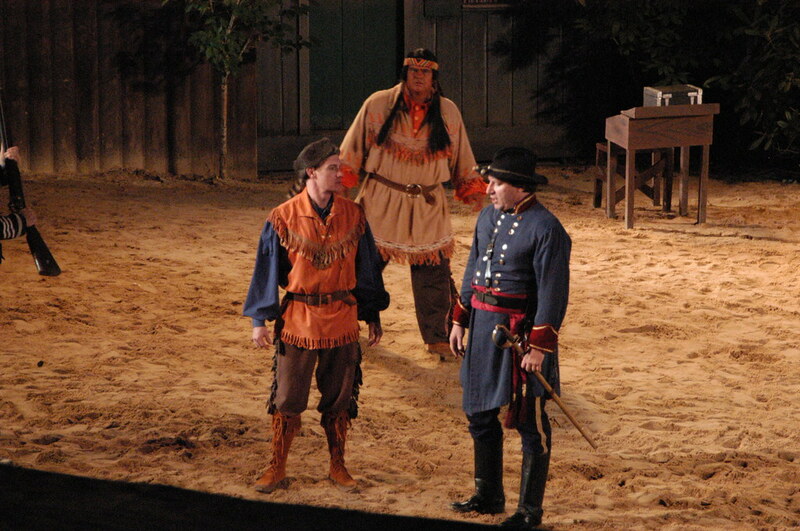 Major Davis of the U.S. Army appeared and read the orders which proclaimed that, before another moon, the Cherokee must be transferred to Indian territory west of the MIssissippi, in the vicinity of Tahlequah, Oklahoma territory. 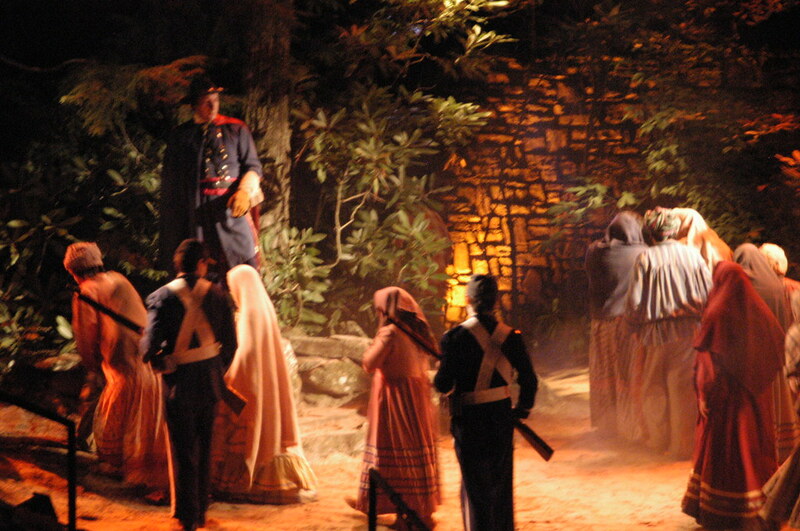 The Cherokee were hearded into stockades in North Carolina, Tennessee, Georgia, and Alabama. 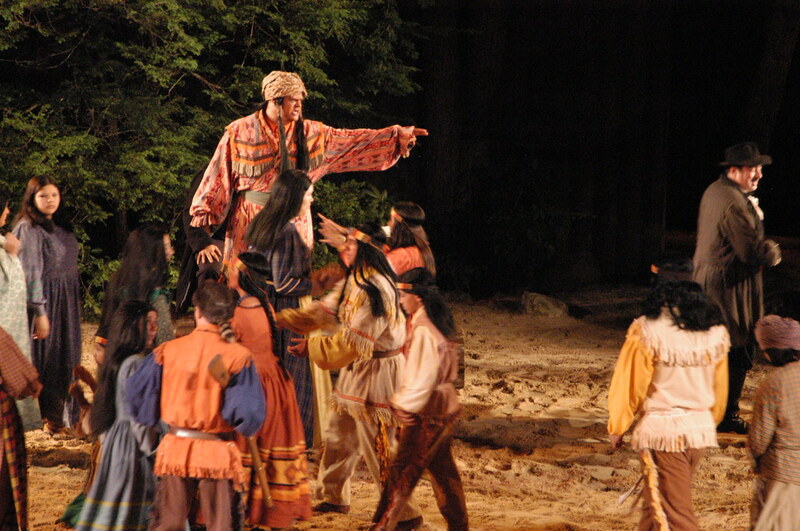 When the soldiers came to take Tsali, his wife Wilani, and their sons, they set off down the trail. 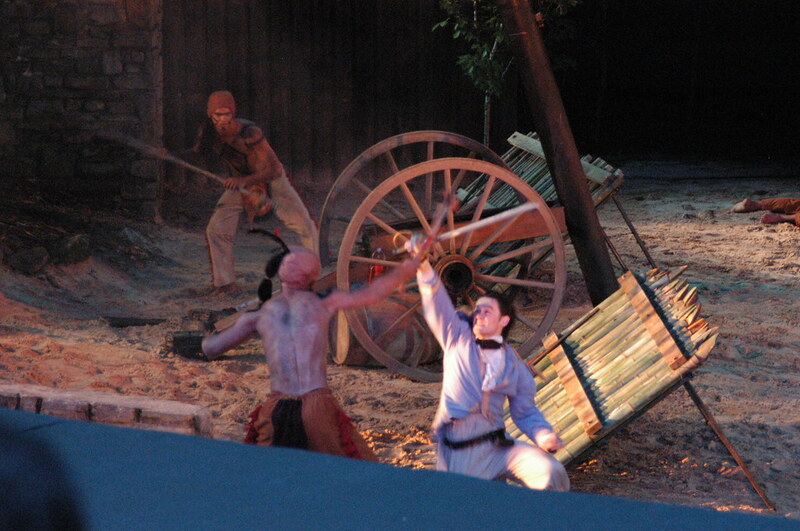 Tsali's wife stumbled and a drunken soldier clubbed her to death. 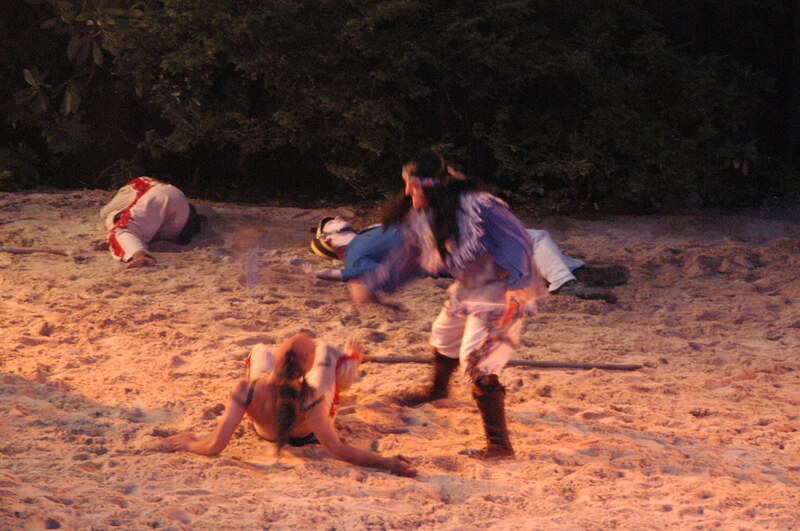 In return, Tsali killed the soldier. 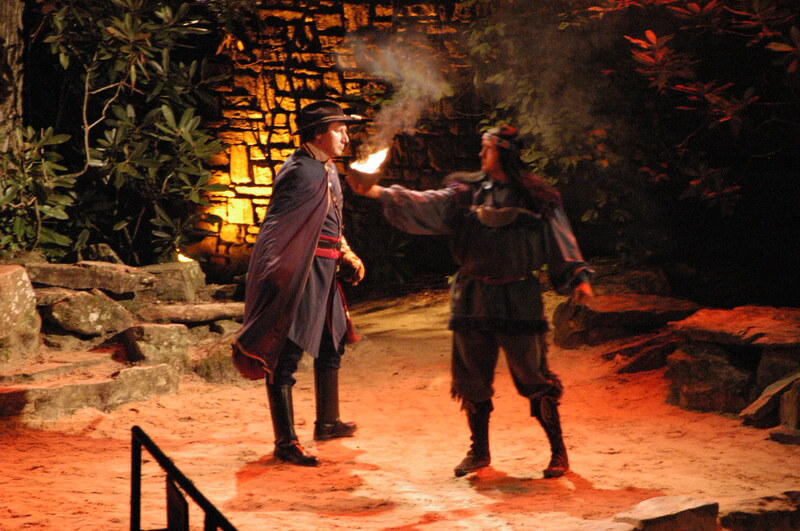 Major Davis sent Will Thomas and Drowning Bear to find Tsali's cave and to tell him that, if he will come in and surrender, all of the others hiding in the mountains will go free. 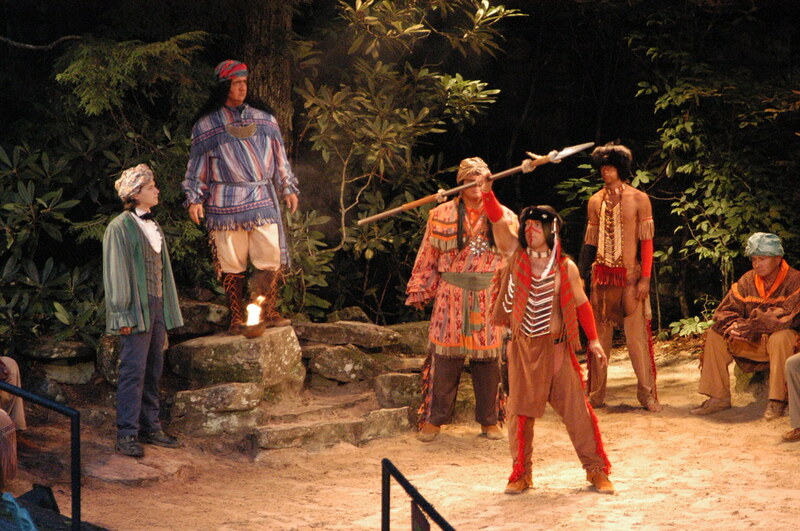 Tsali arrived with his three sons. 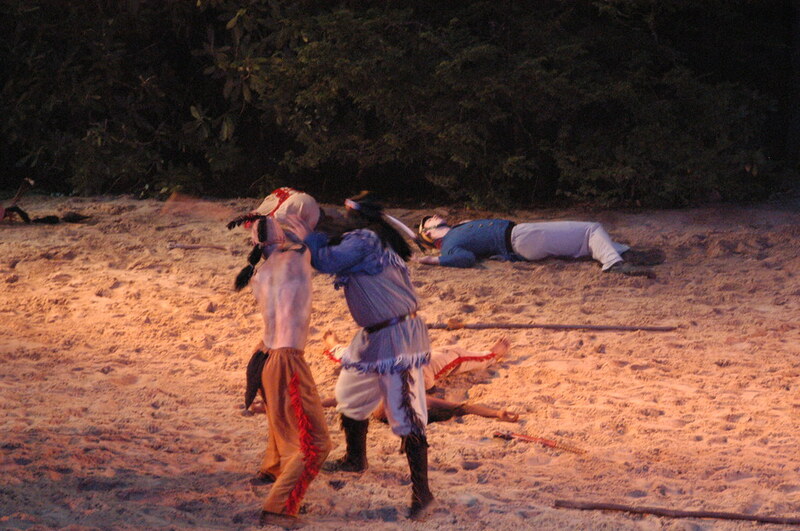 Tsali and two sons were to be placed before a firing squad. 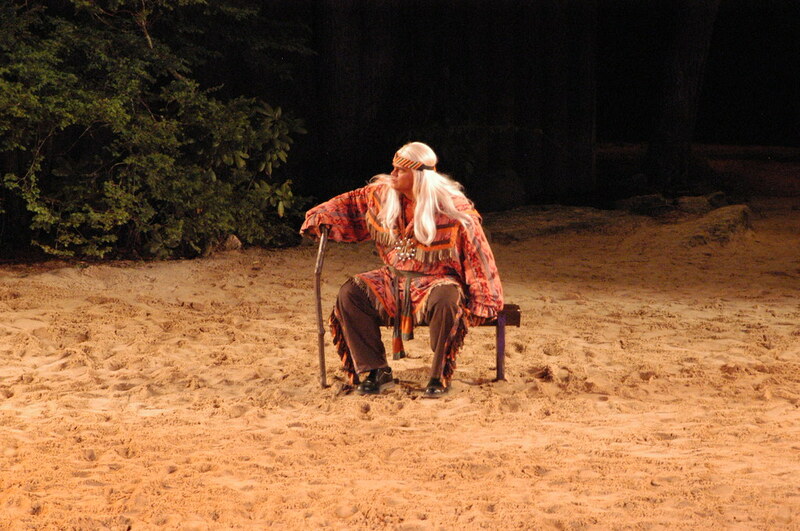 The life of his youngest son was spared. 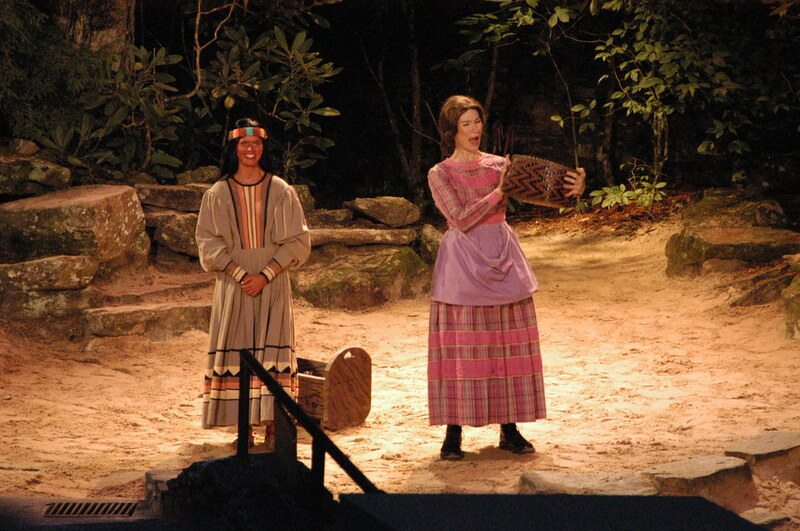 Because of Tsali's sacrifice, a remnant of his race was permitted to remain in the Great Smokies. 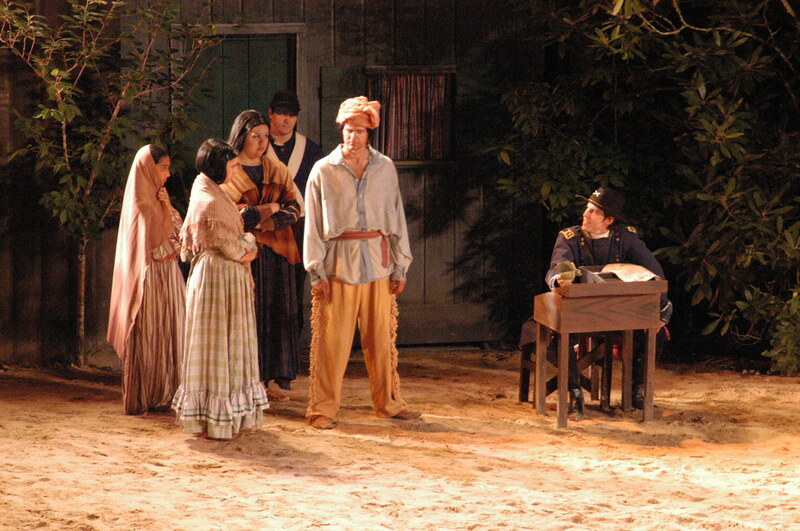 The rest of his people were sent streaming into exile—a 1,200-mile journey—and only those who had hid out were allowed to remain. 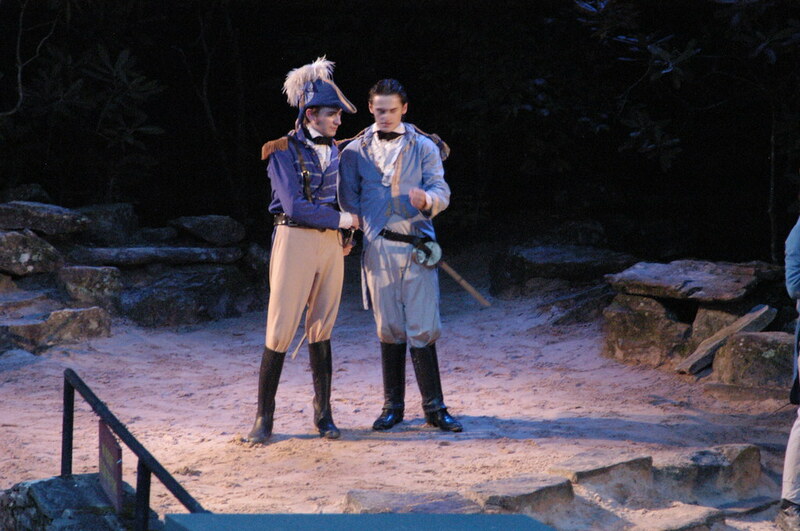 The years passed on. 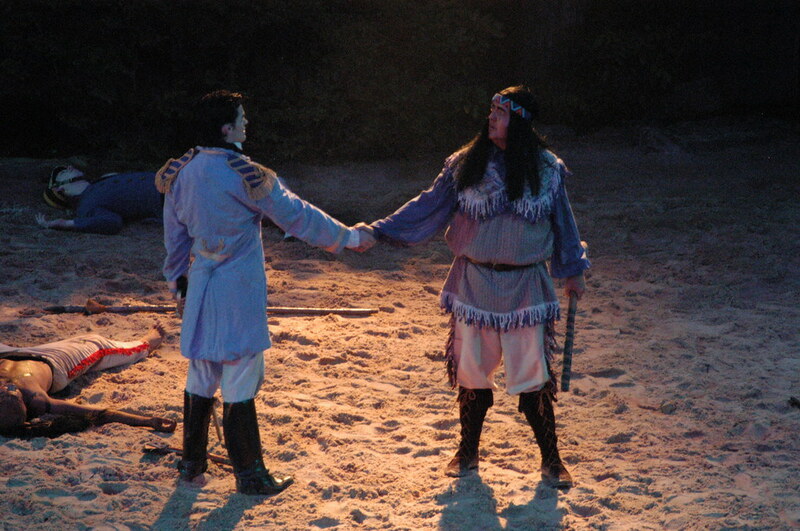 Drowning Bear and Will Thomas went to Washington to see President Harrison about establishing a reservation for the Cherokees who remained behind. 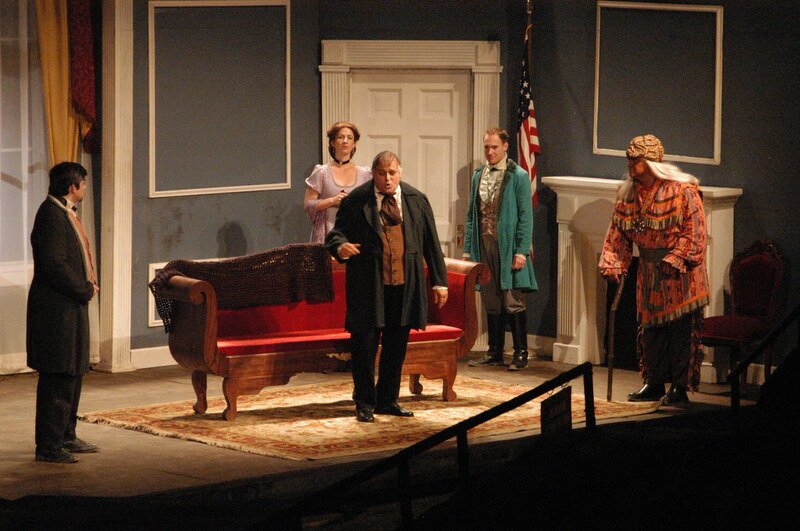 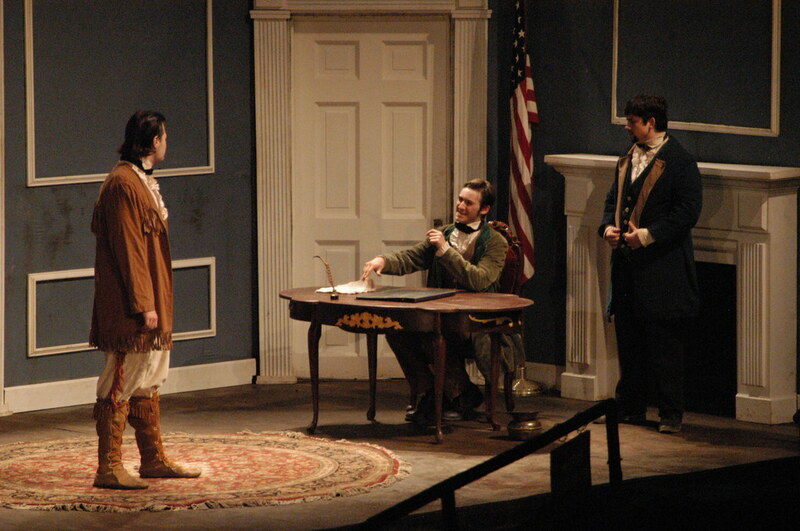 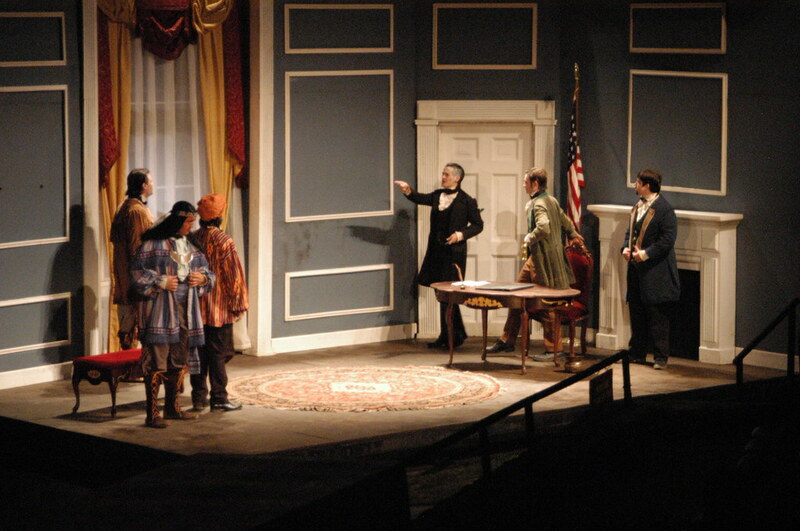 The death of President Harrison turns Washington's attention away from the Cherokee. 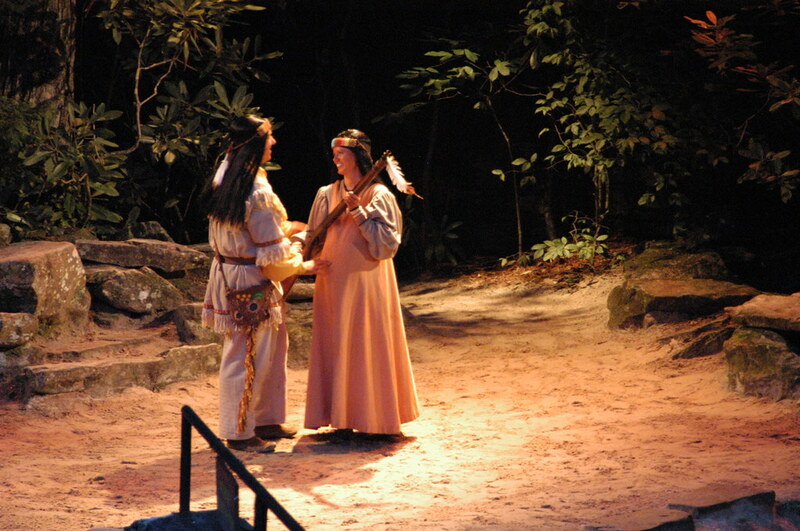 The Cherokee were beginning to find peace. 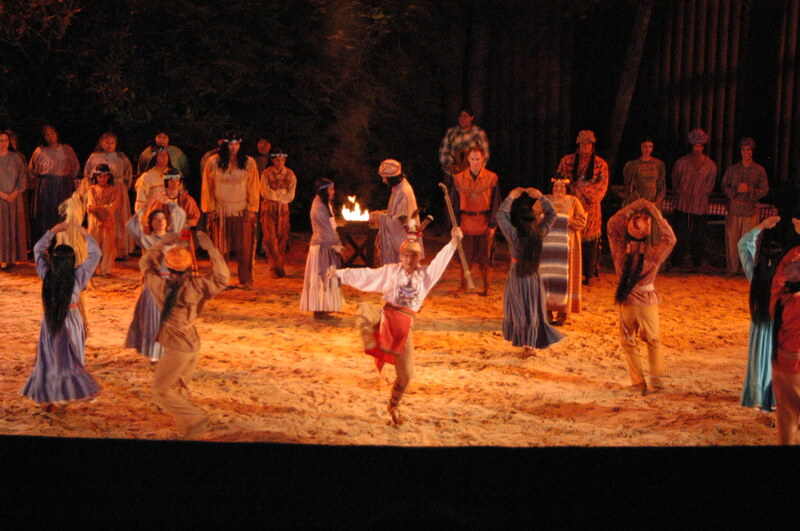 Will Thomas bought up land and allowed the Cherokee to live there. 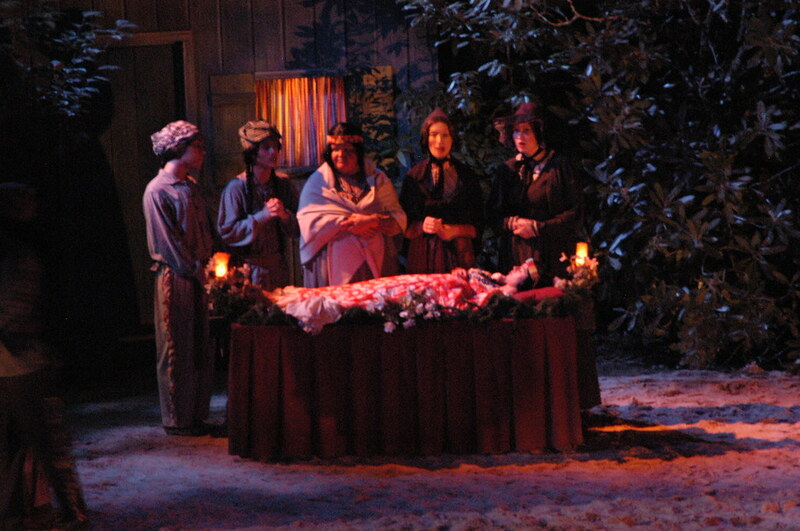 Thomas held the deed for them and gave them a home. 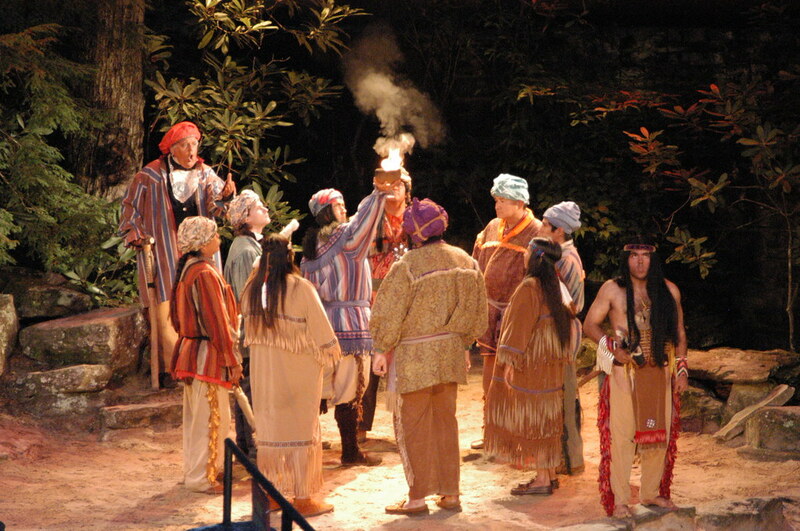 Chief Junaluska returned from Oklahoma to find his people living in peace with their white neighbors.